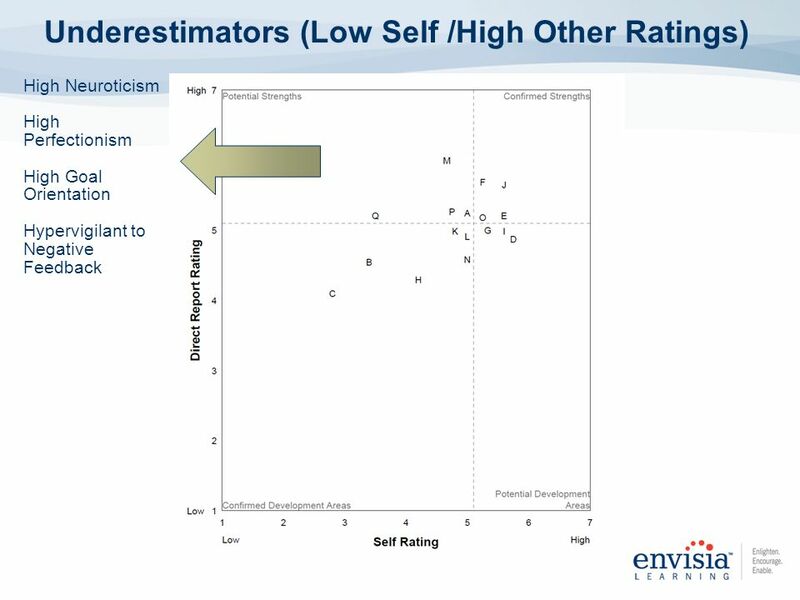 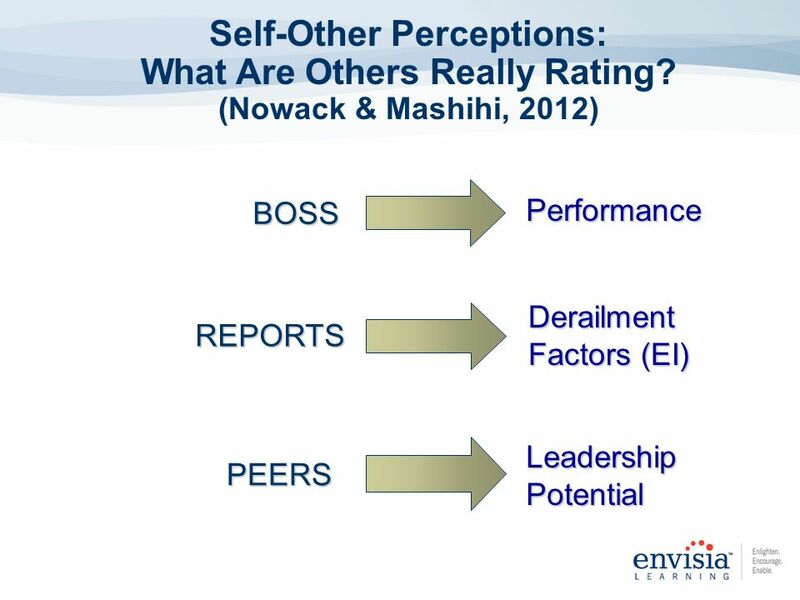 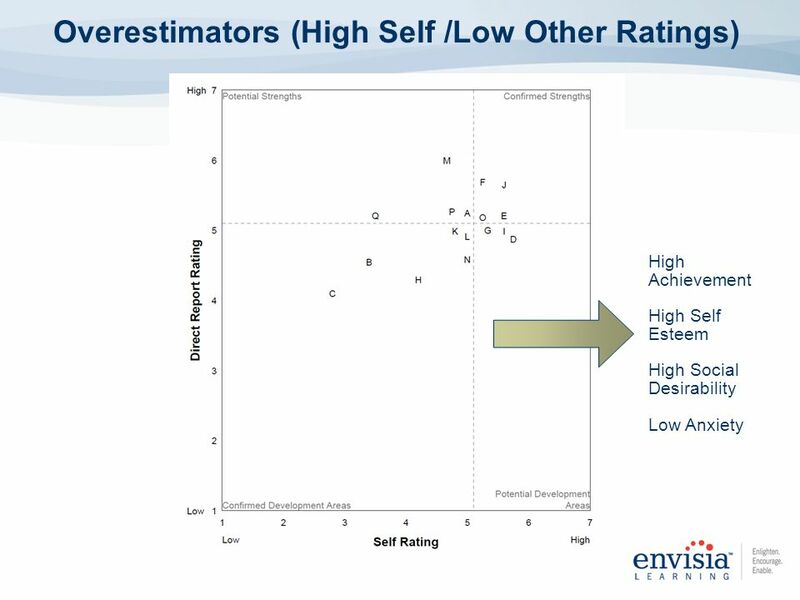 20 Self-Other Perceptions: What Are Others Really Rating? 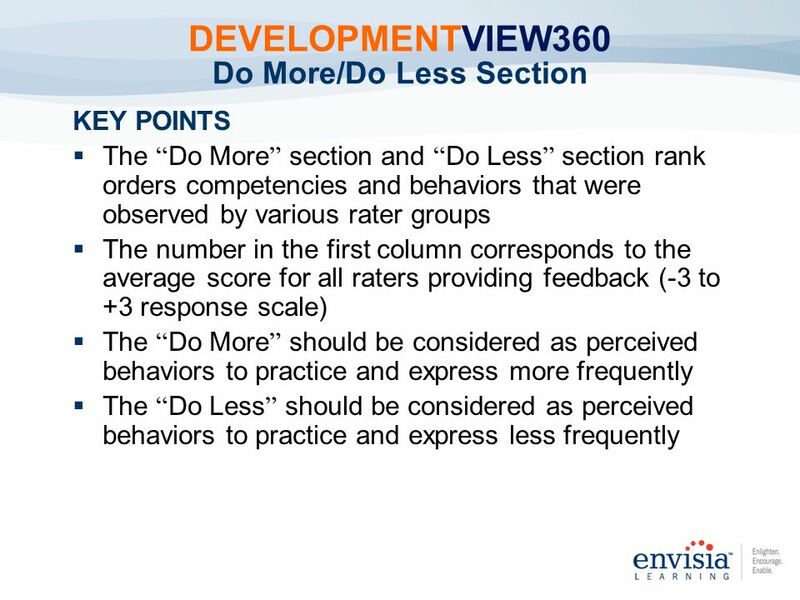 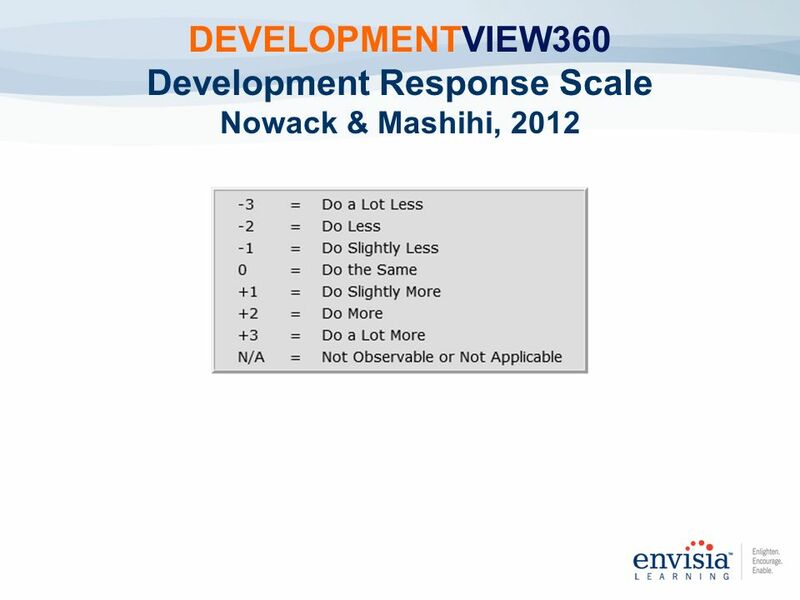 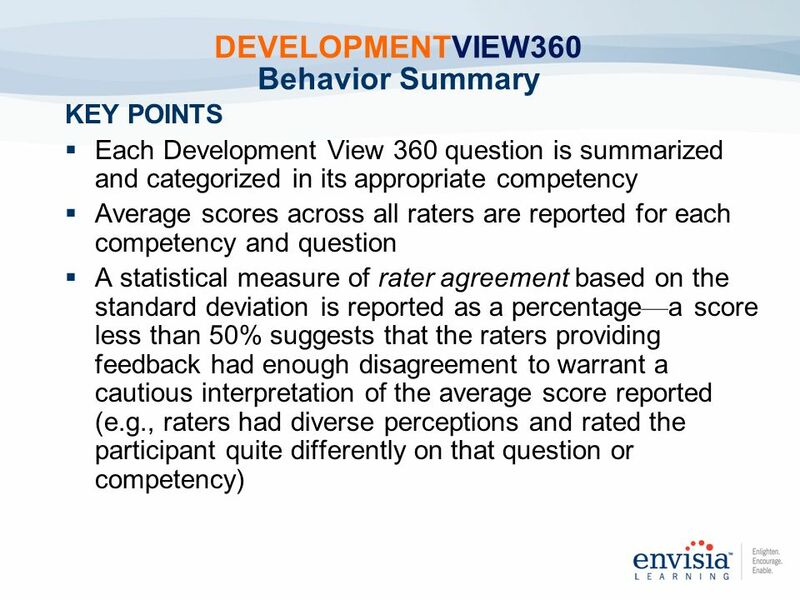 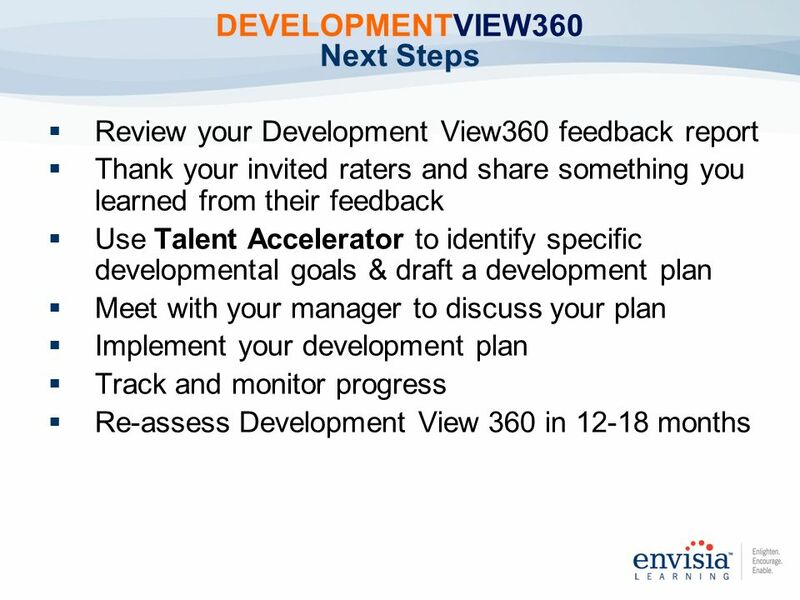 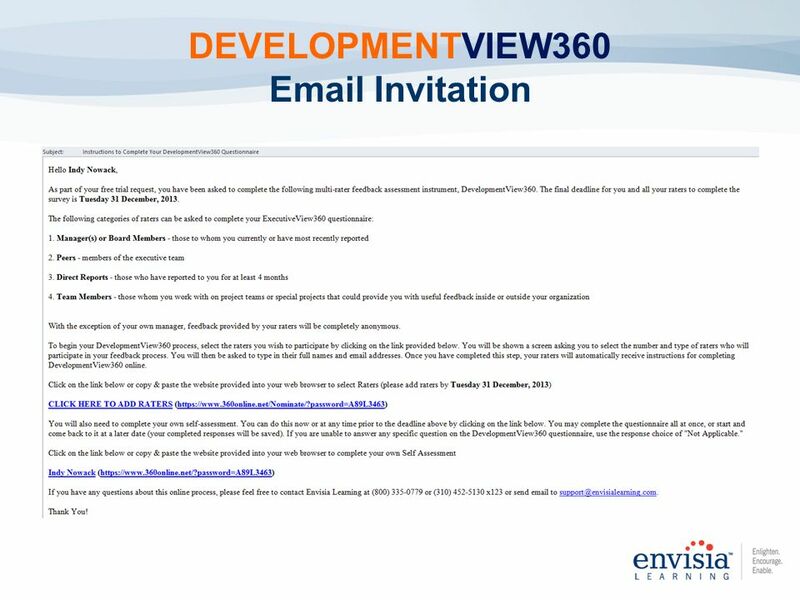 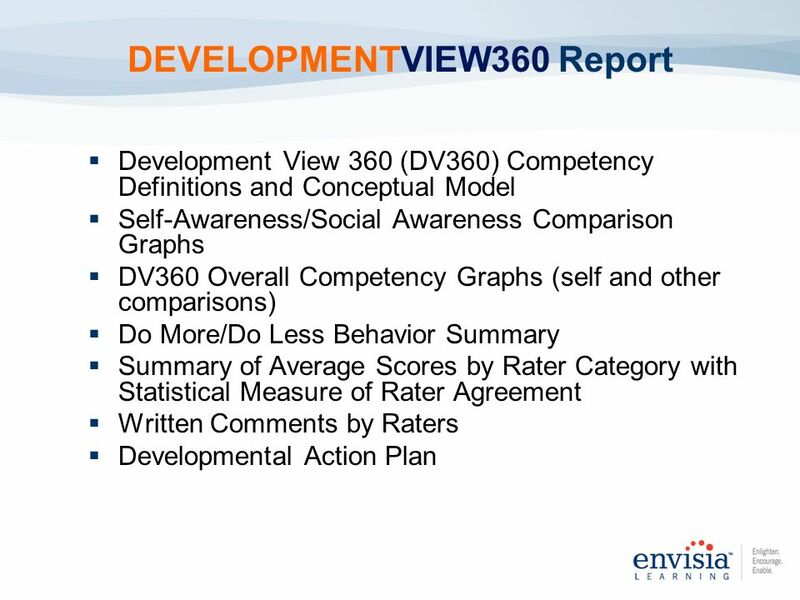 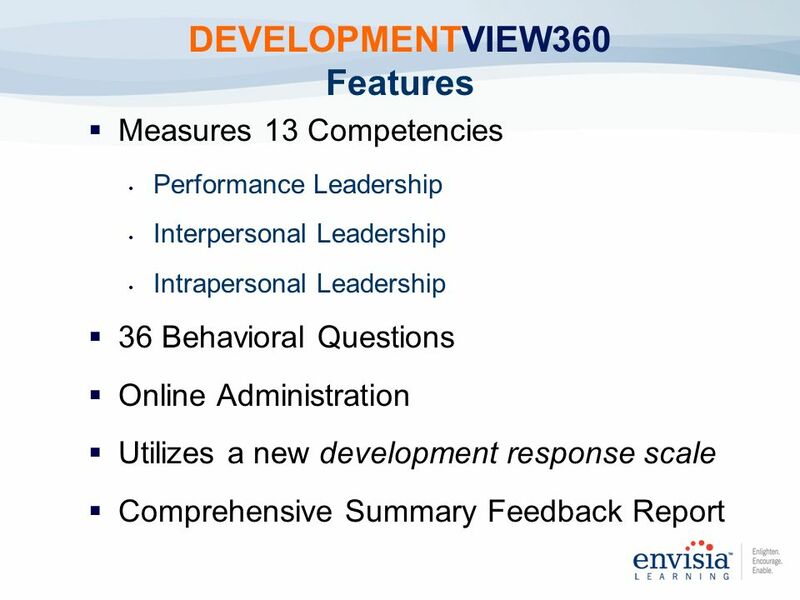 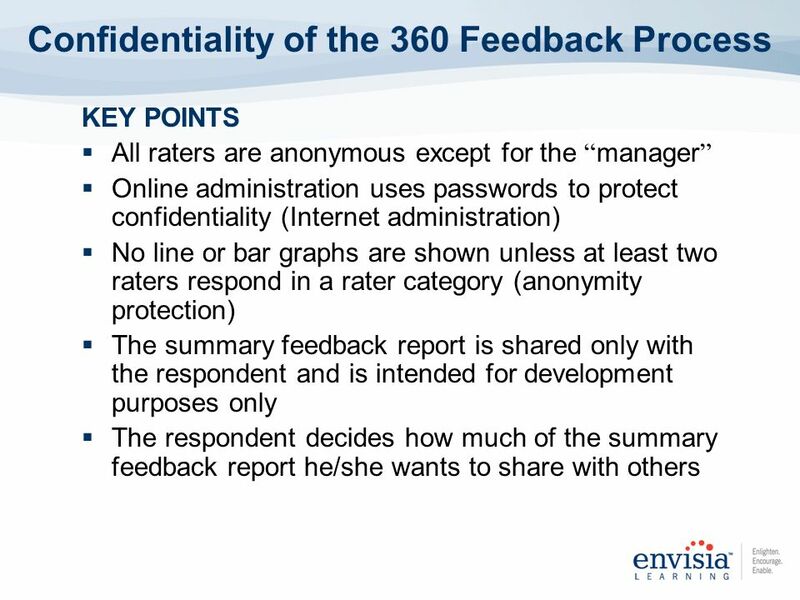 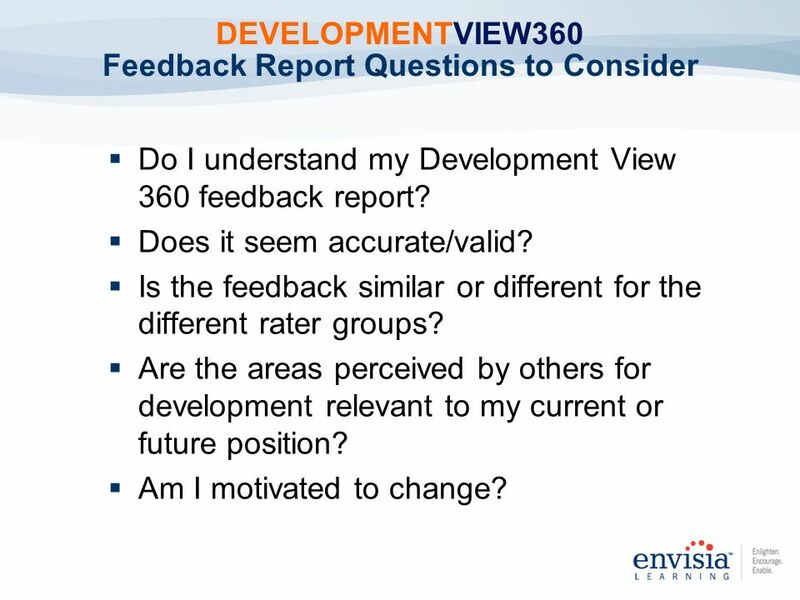 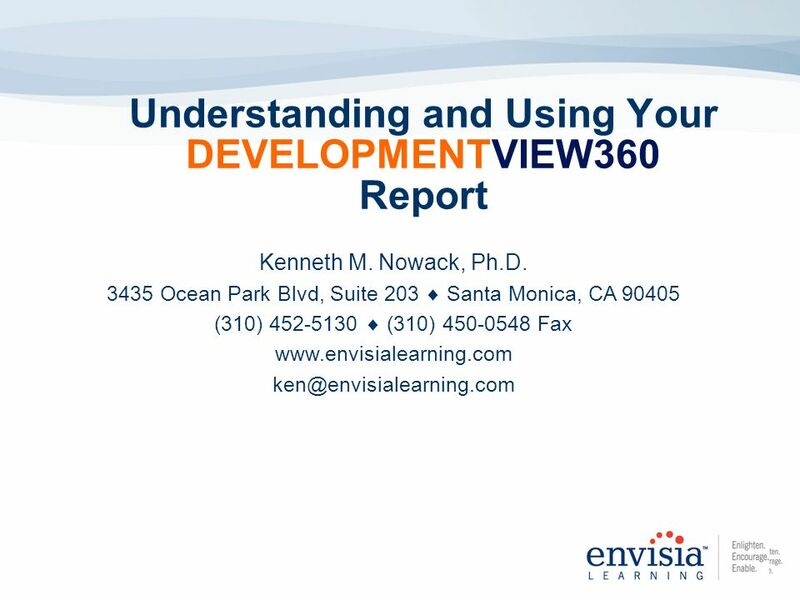 Do I understand my Development View 360 feedback report? 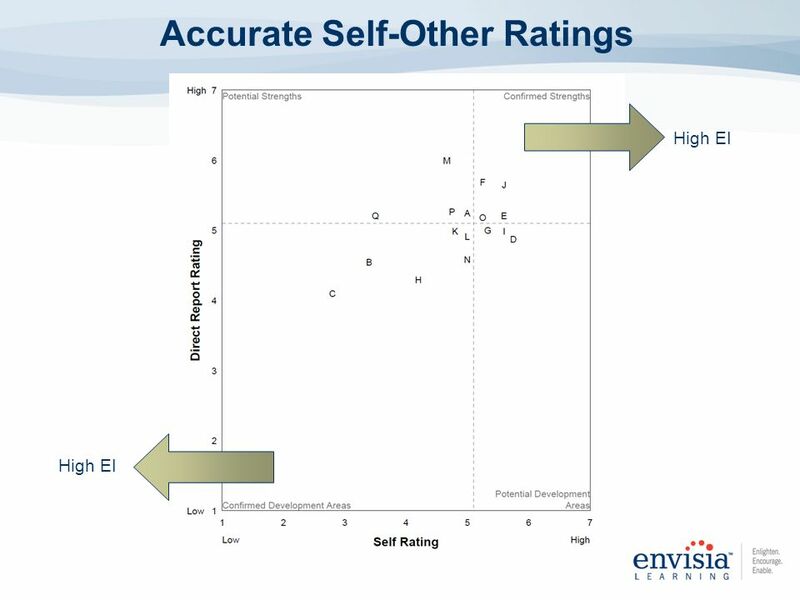 Does it seem accurate/valid? 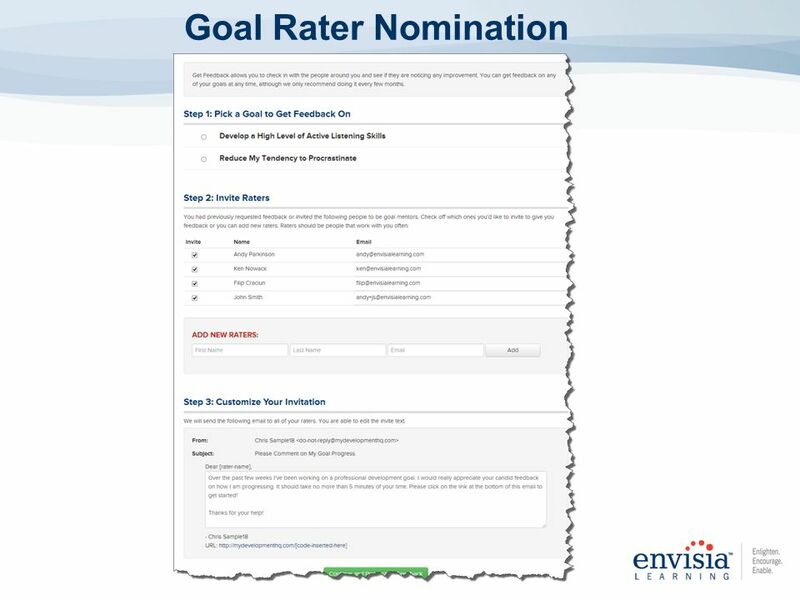 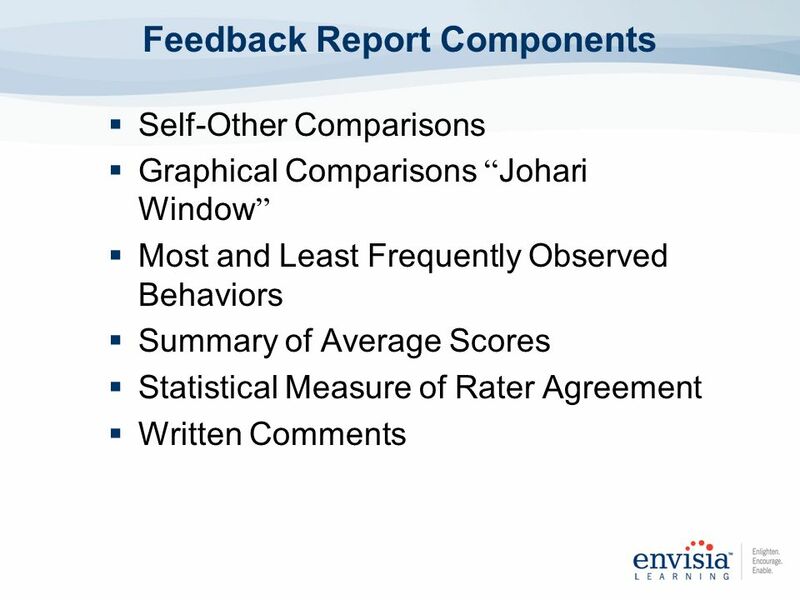 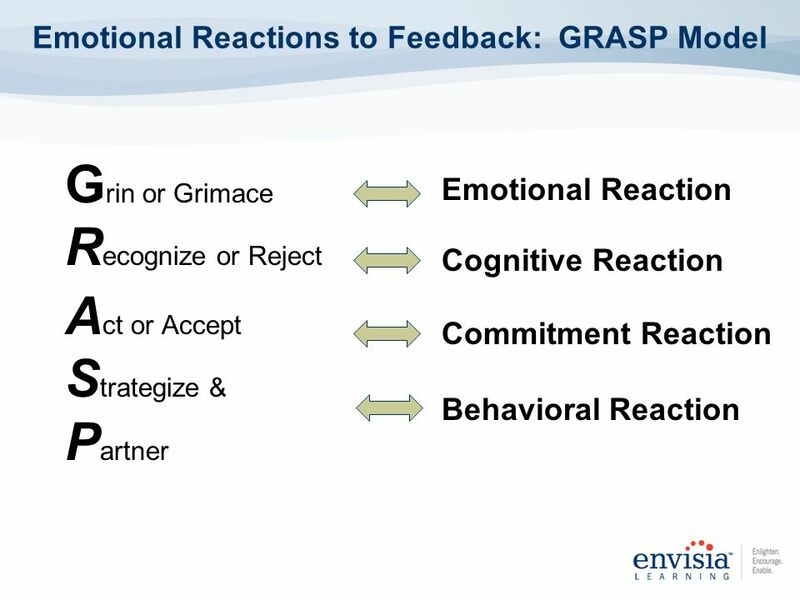 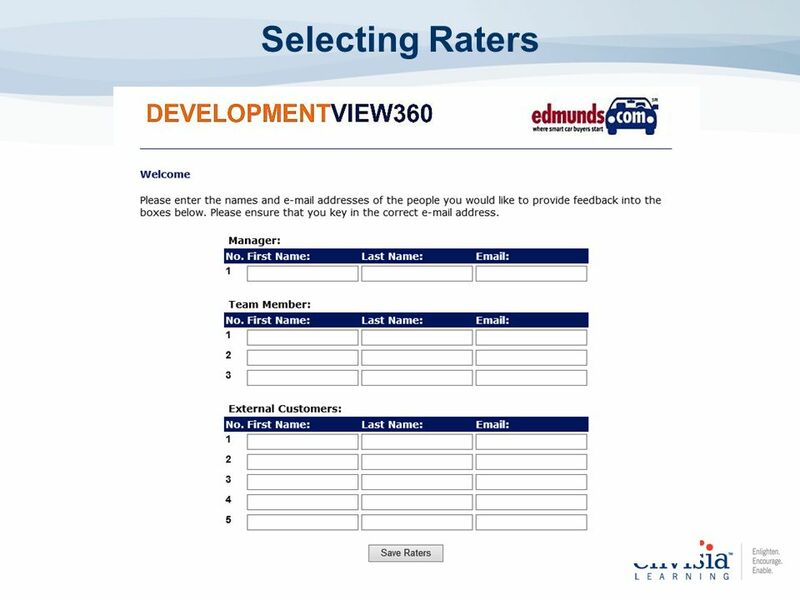 Is the feedback similar or different for the different rater groups? 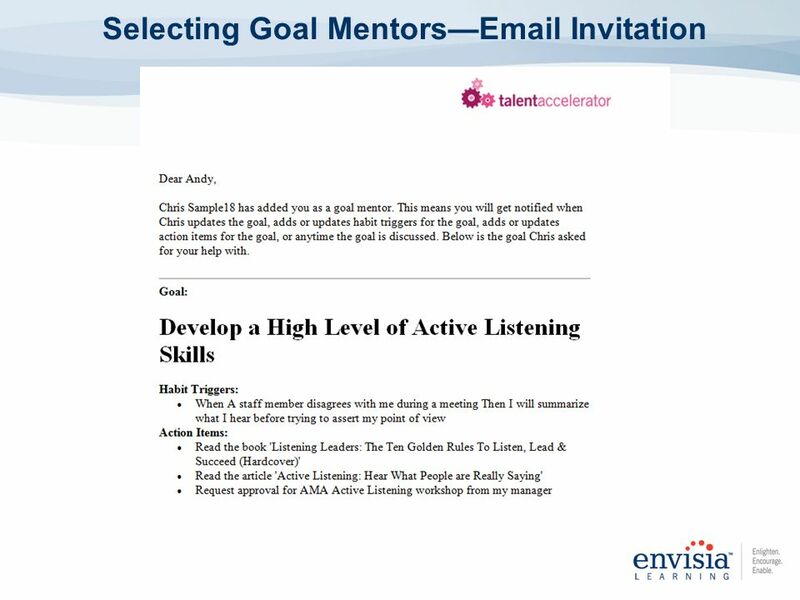 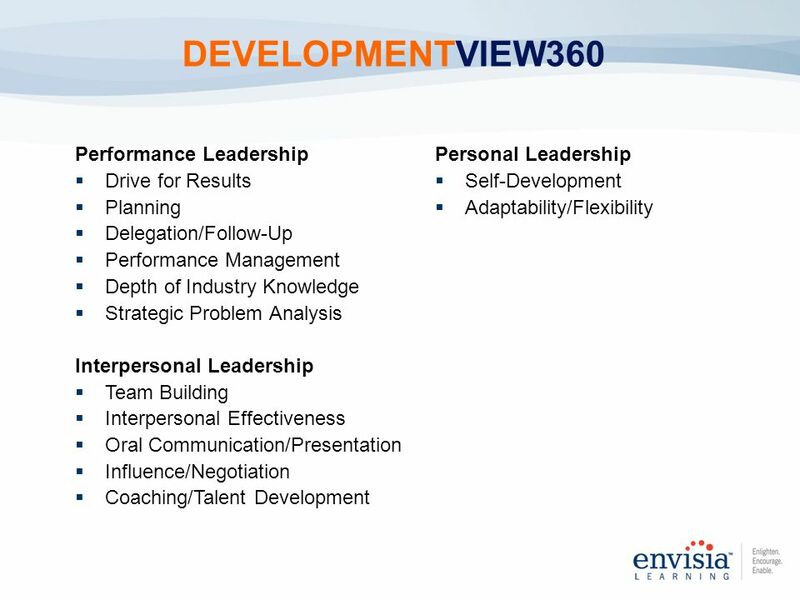 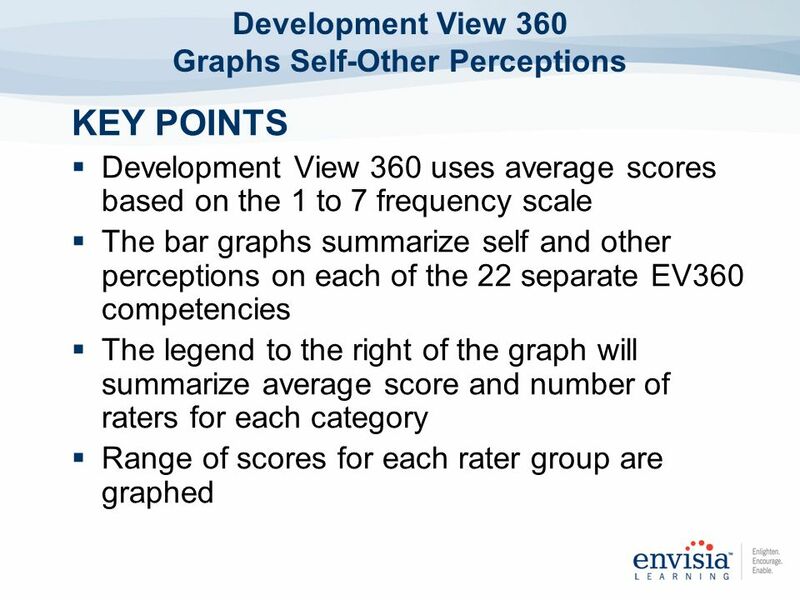 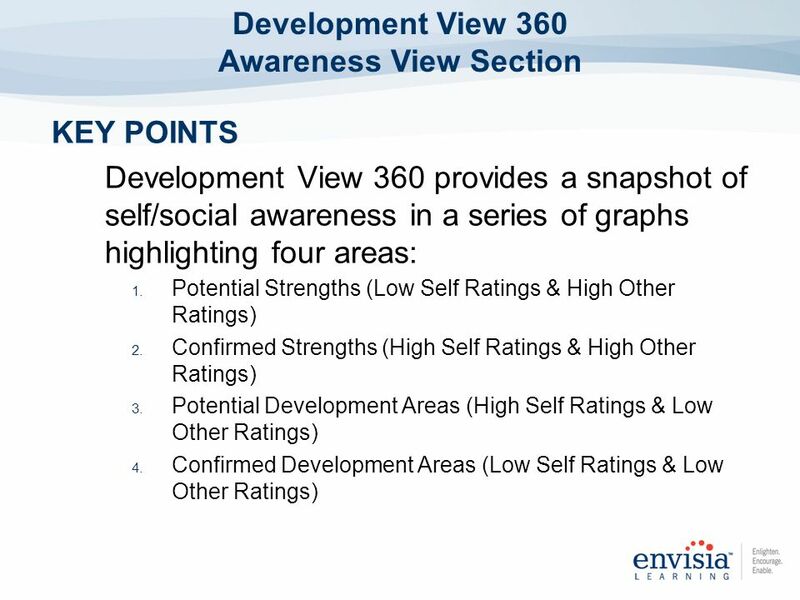 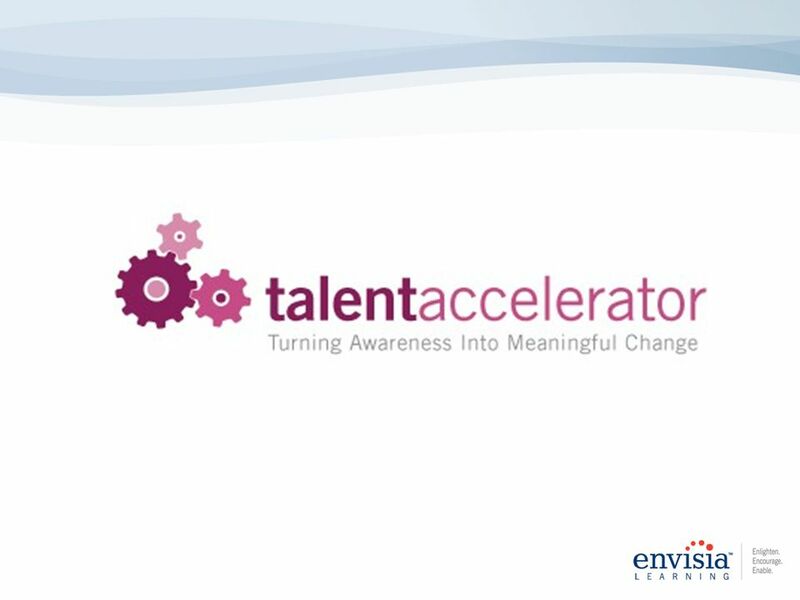 Are the areas perceived by others for development relevant to my current or future position? 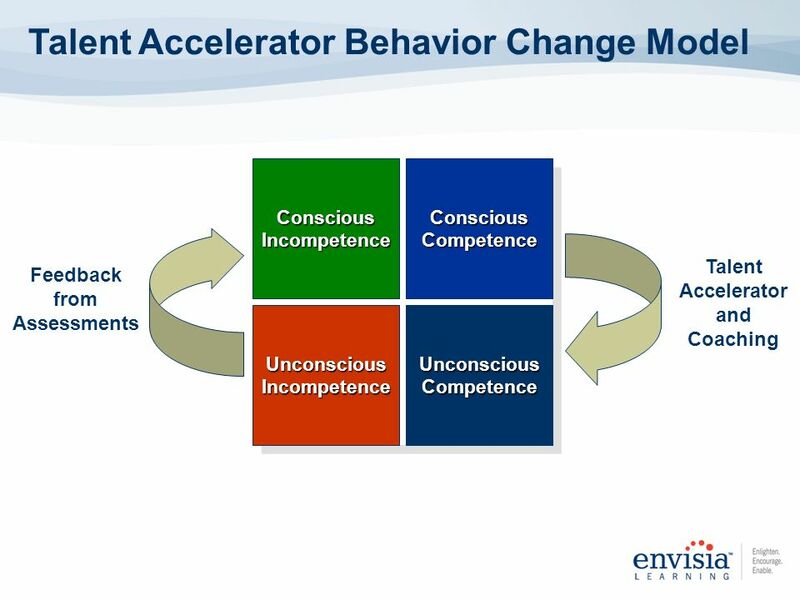 Am I motivated to change? 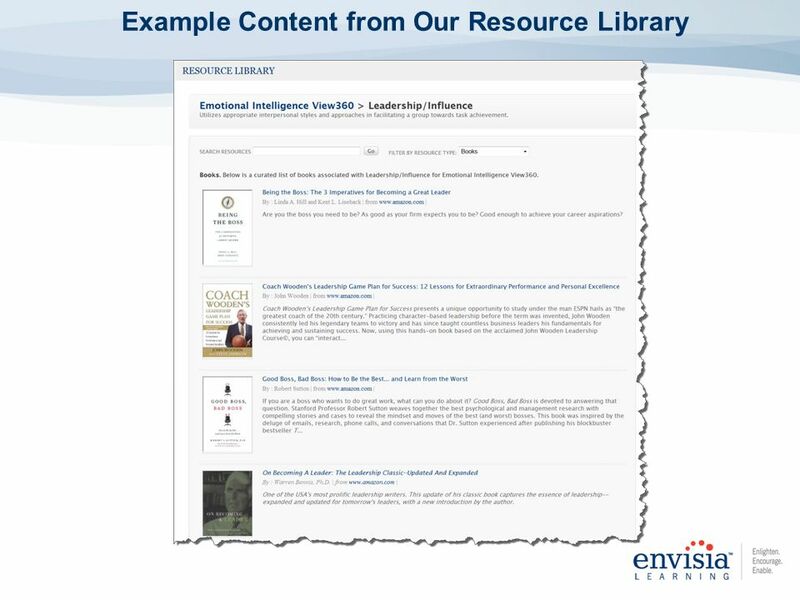 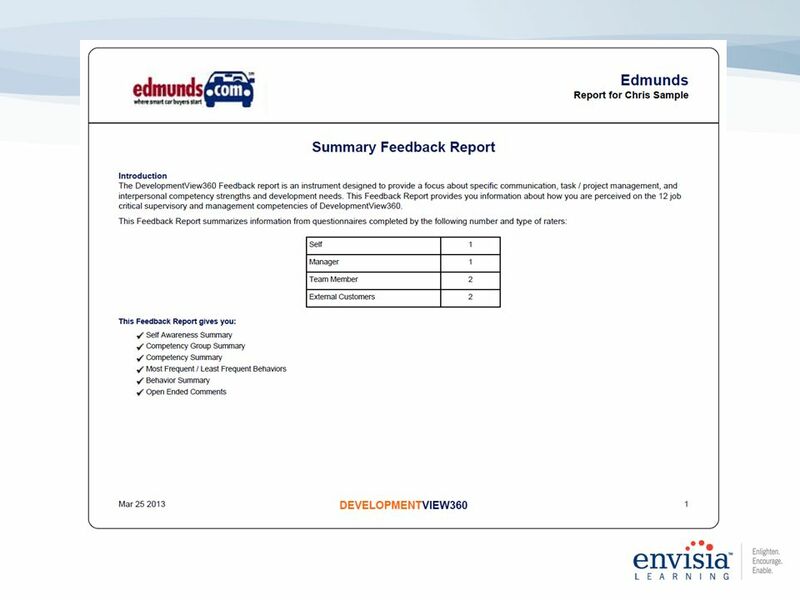 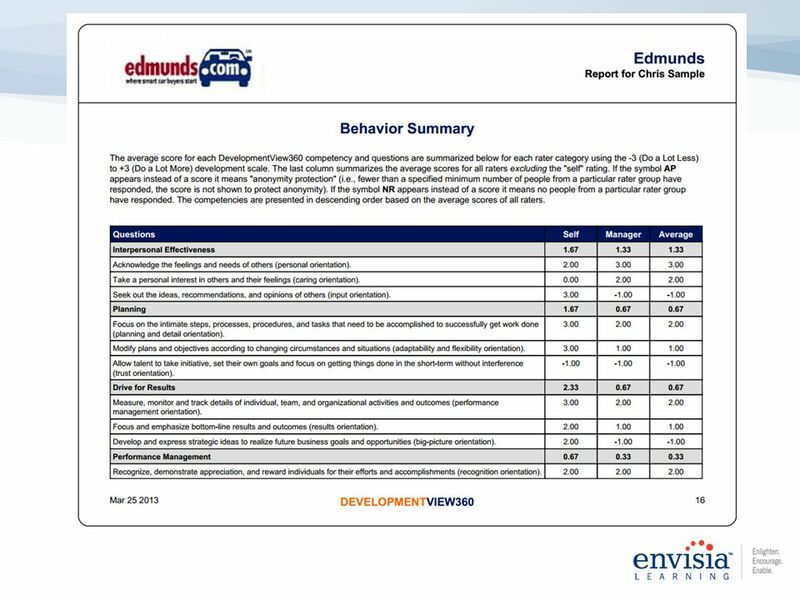 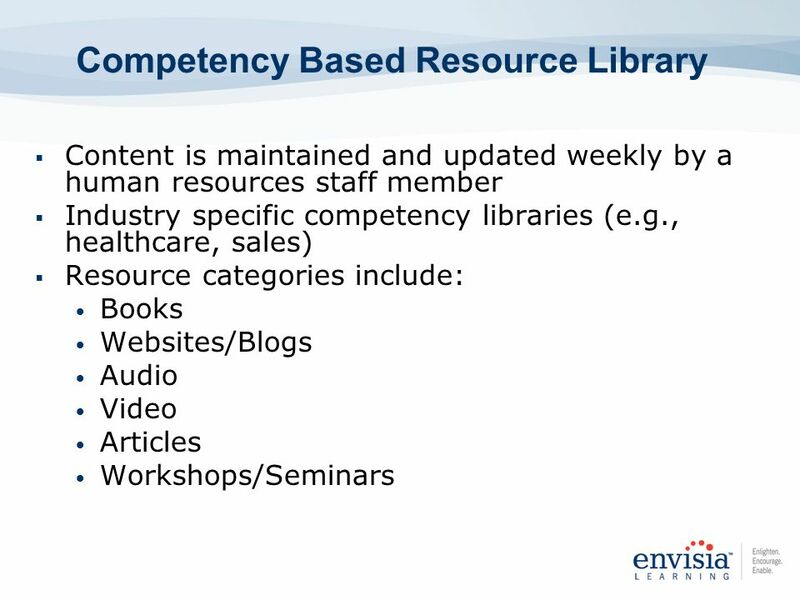 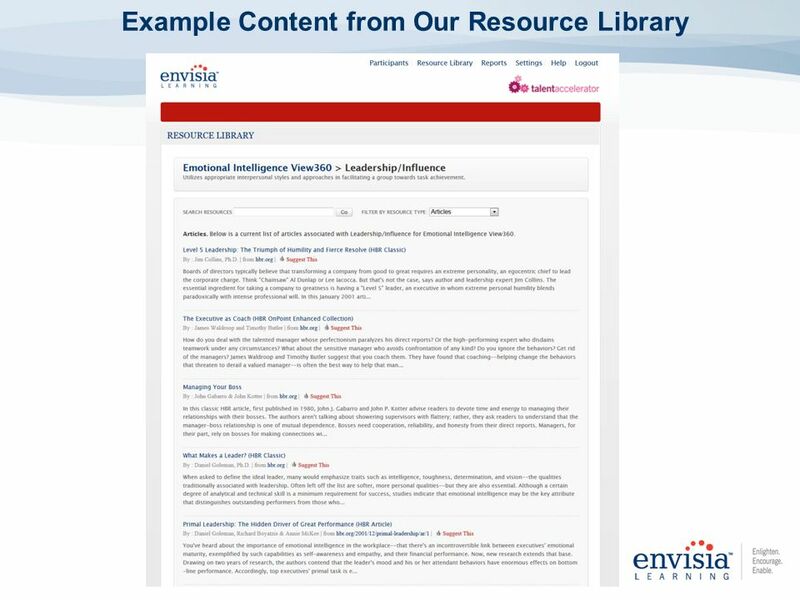 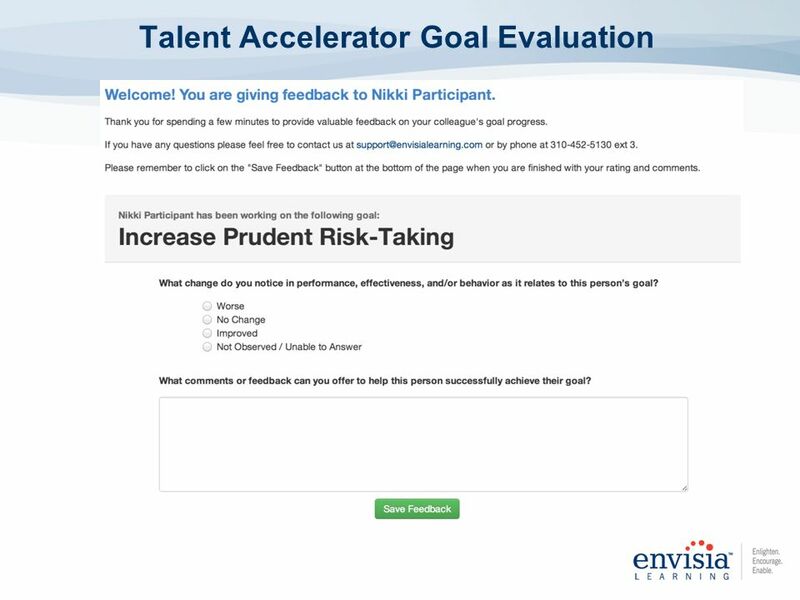 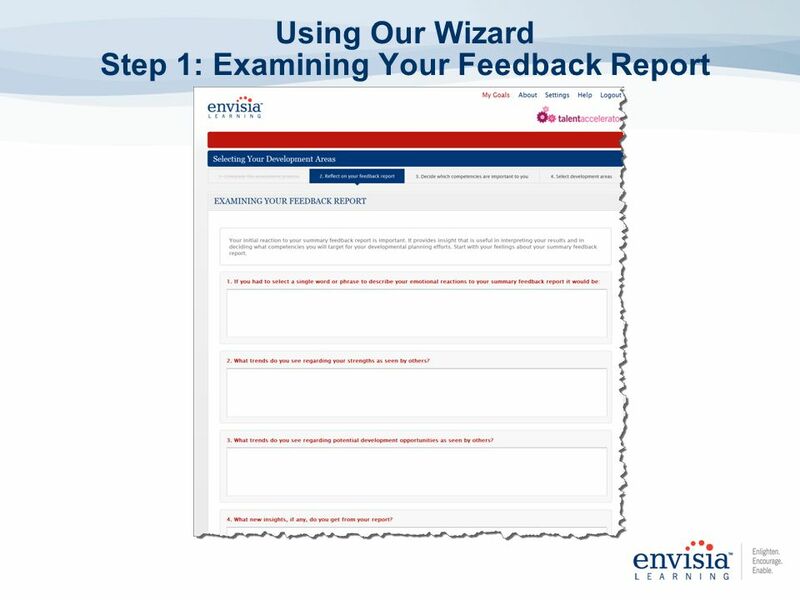 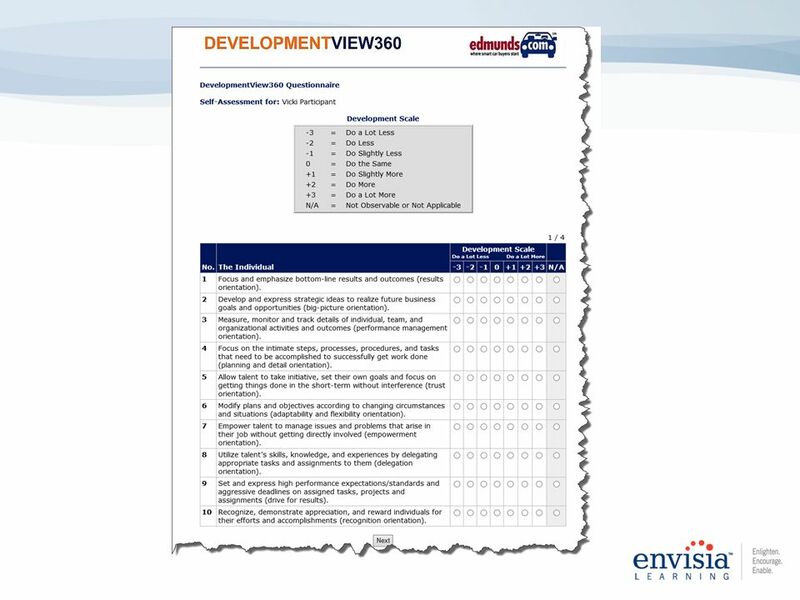 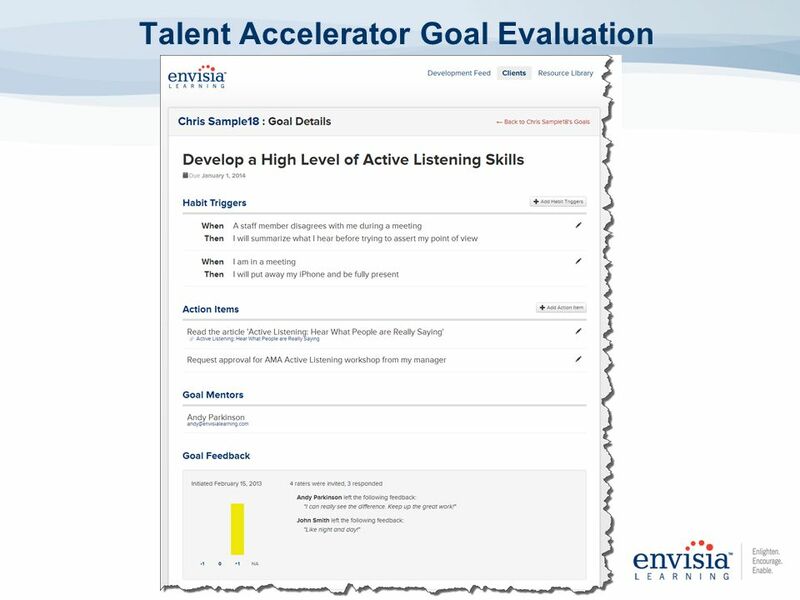 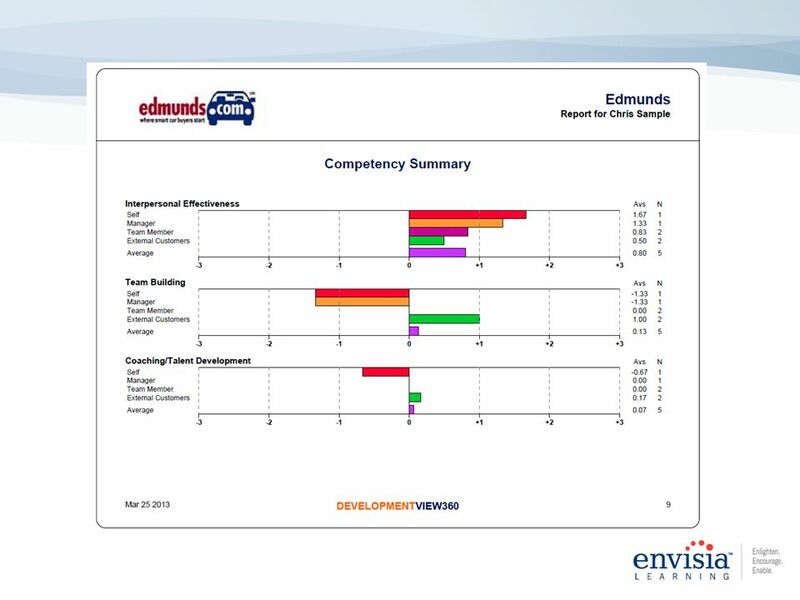 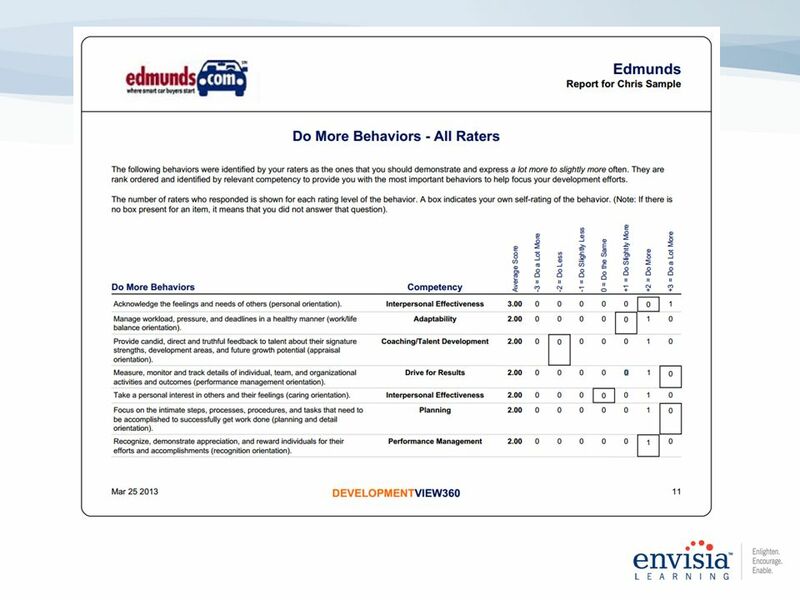 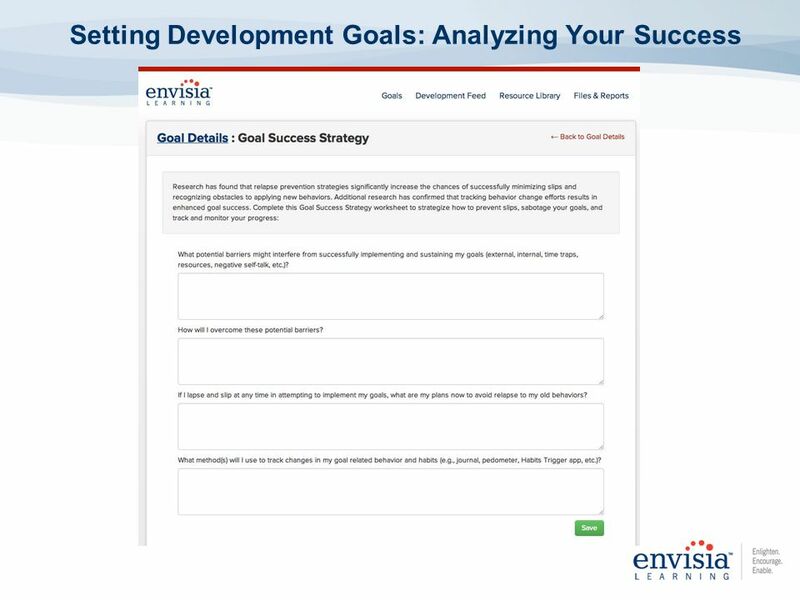 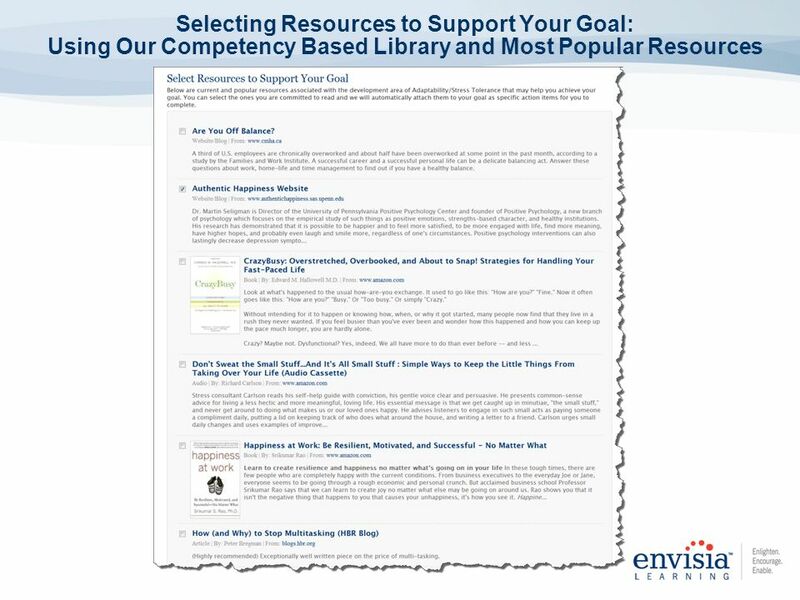 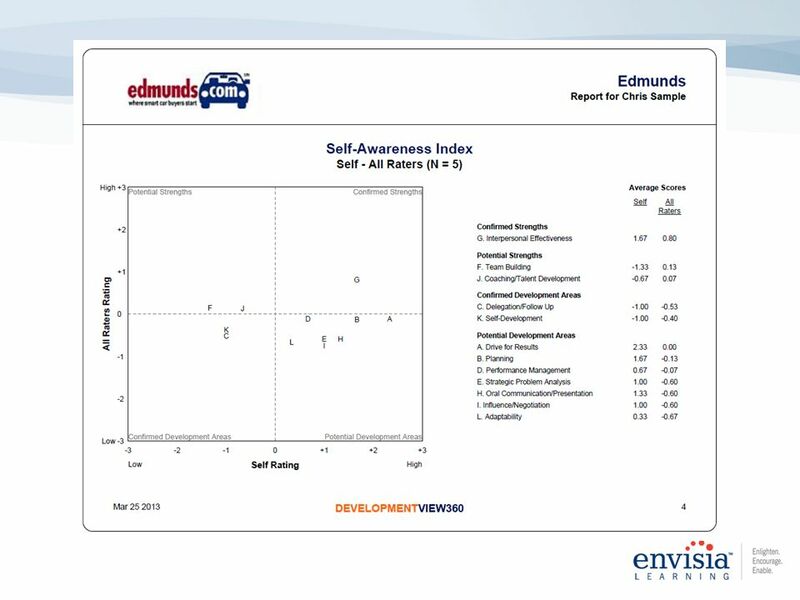 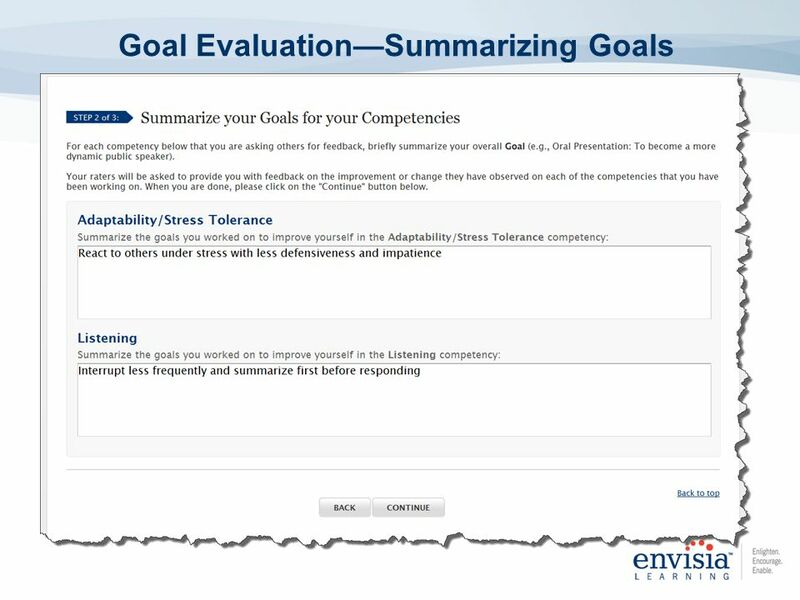 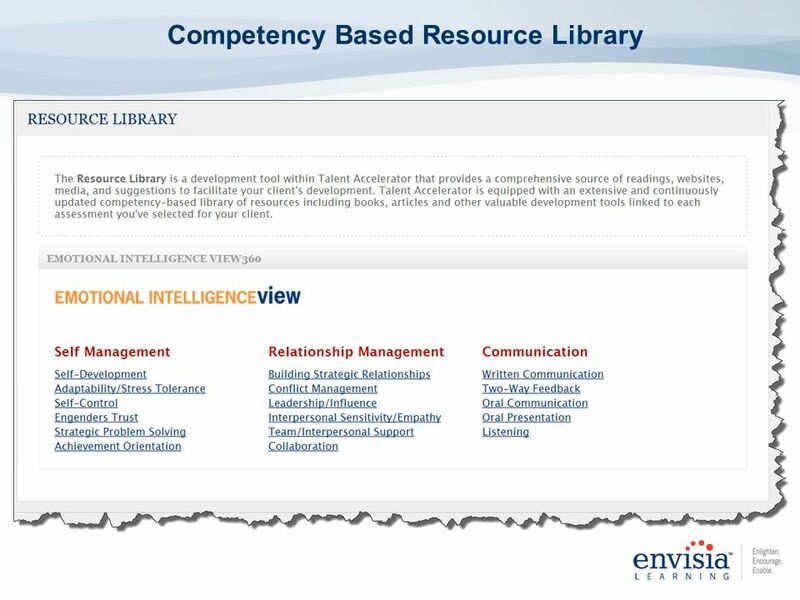 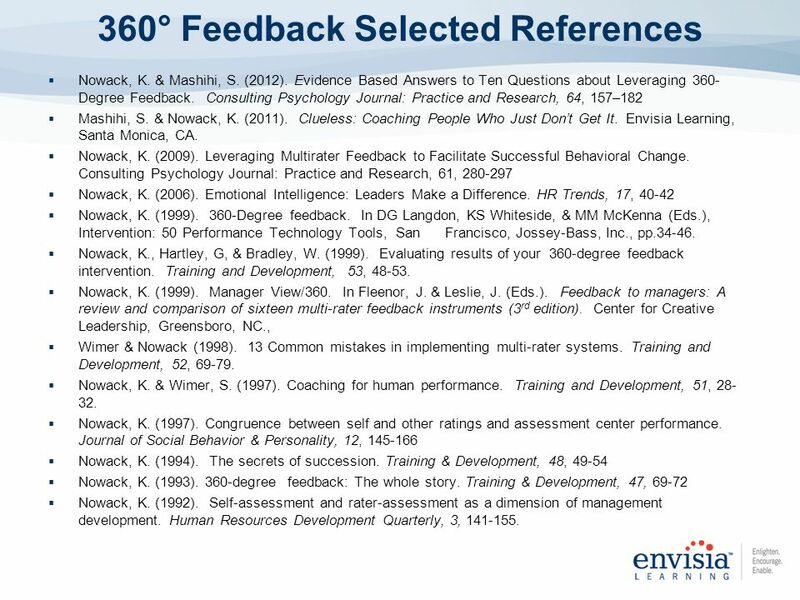 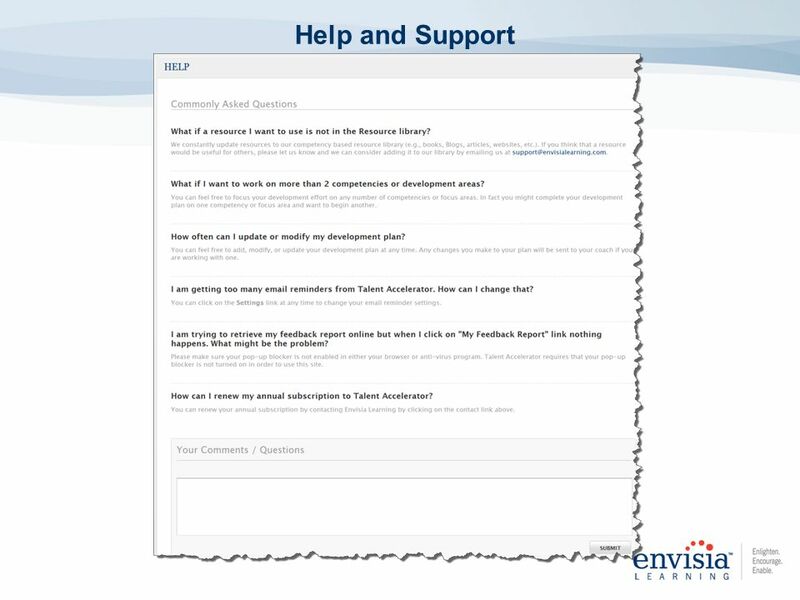 Development Resource Library: Comprehensive source of readings, websites, media, and suggestions to facilitate your development Feedback Reports: Electronic copy of your assessment summary report. 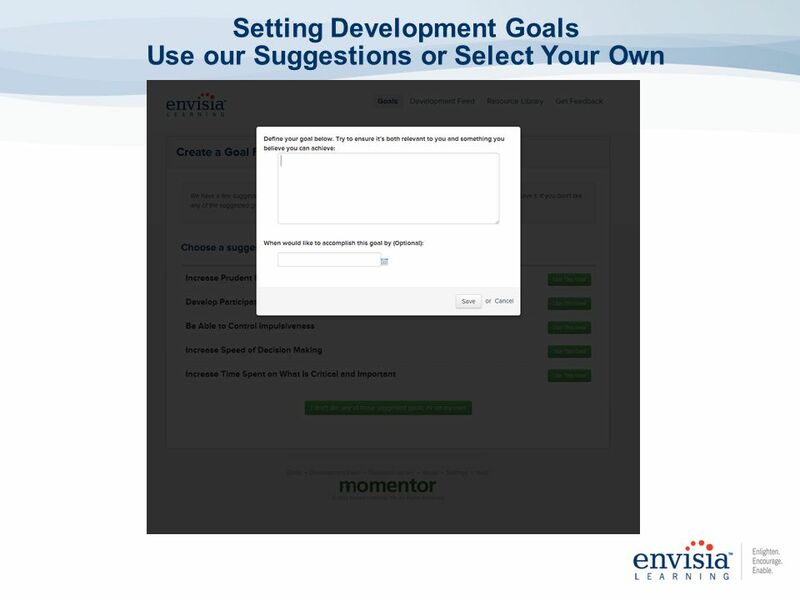 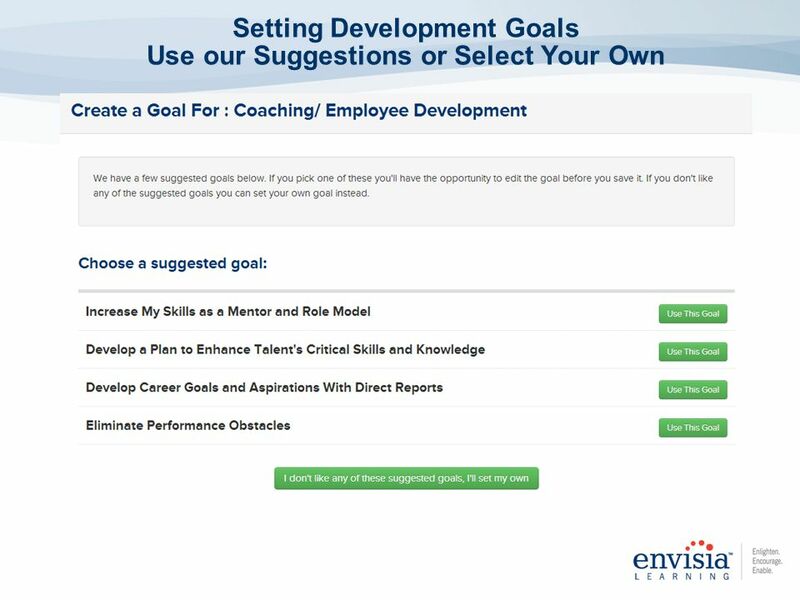 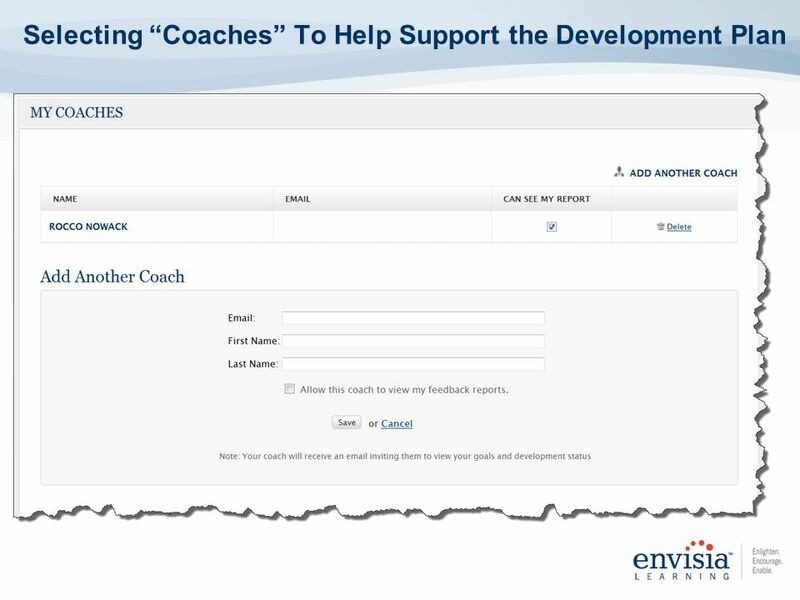 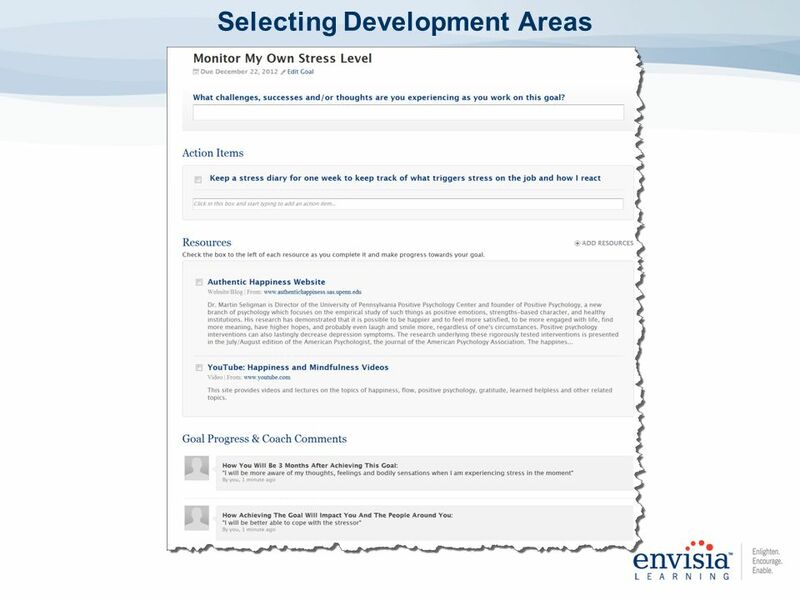 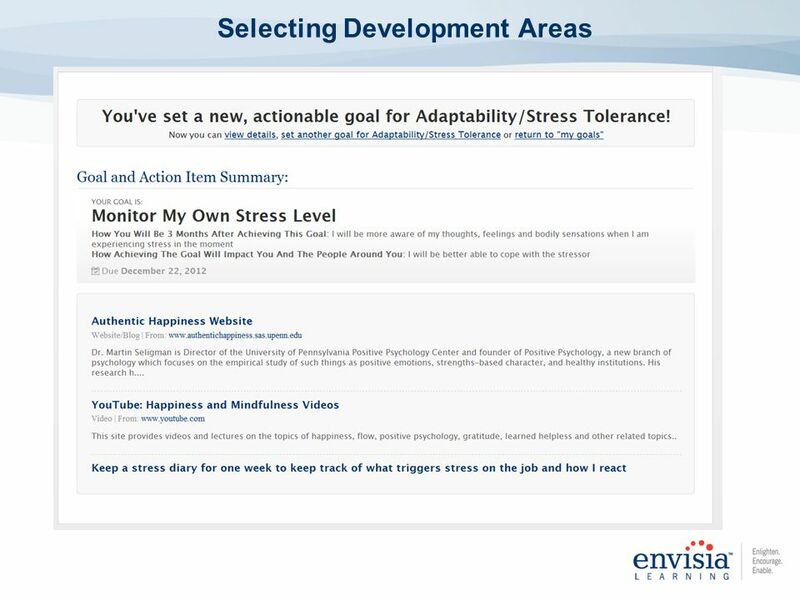 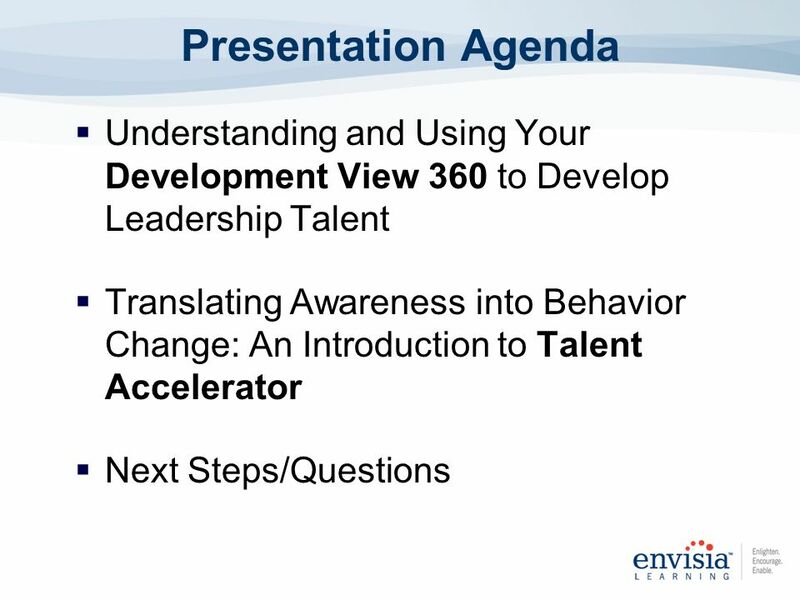 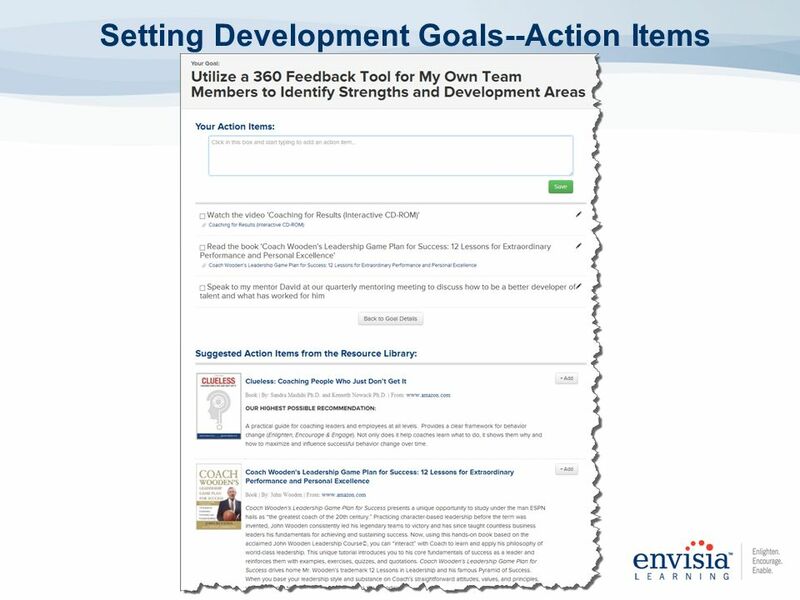 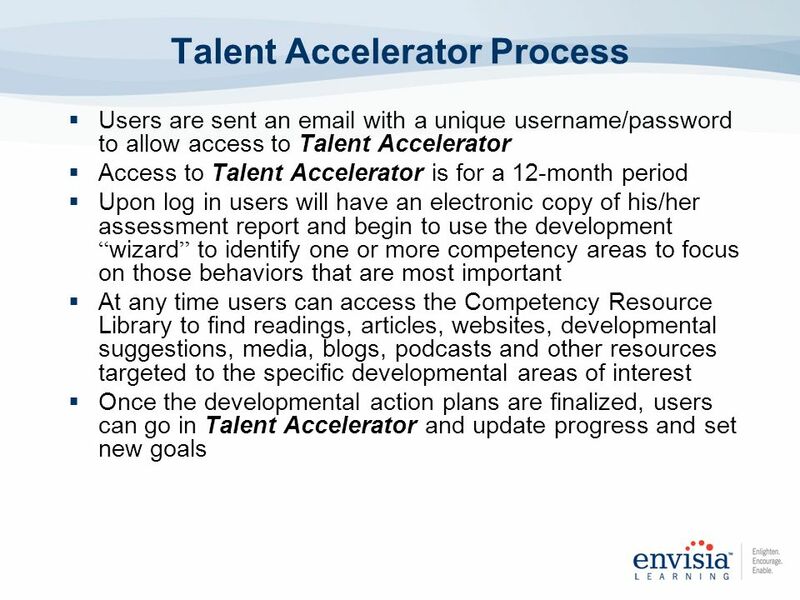 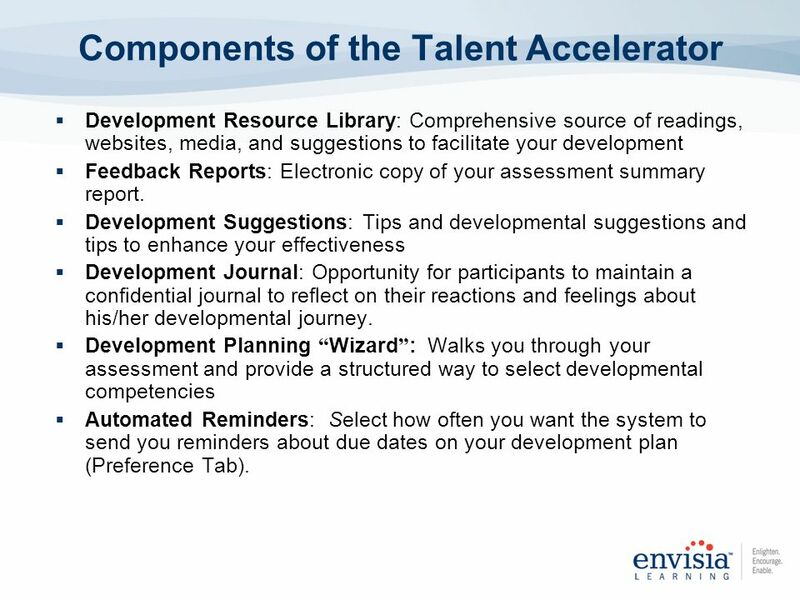 Development Suggestions: Tips and developmental suggestions and tips to enhance your effectiveness Development Journal: Opportunity for participants to maintain a confidential journal to reflect on their reactions and feelings about his/her developmental journey. 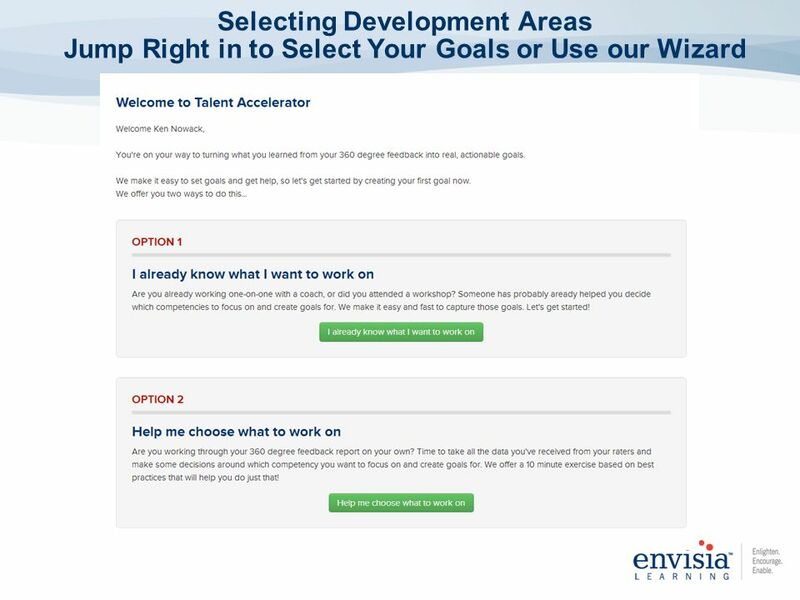 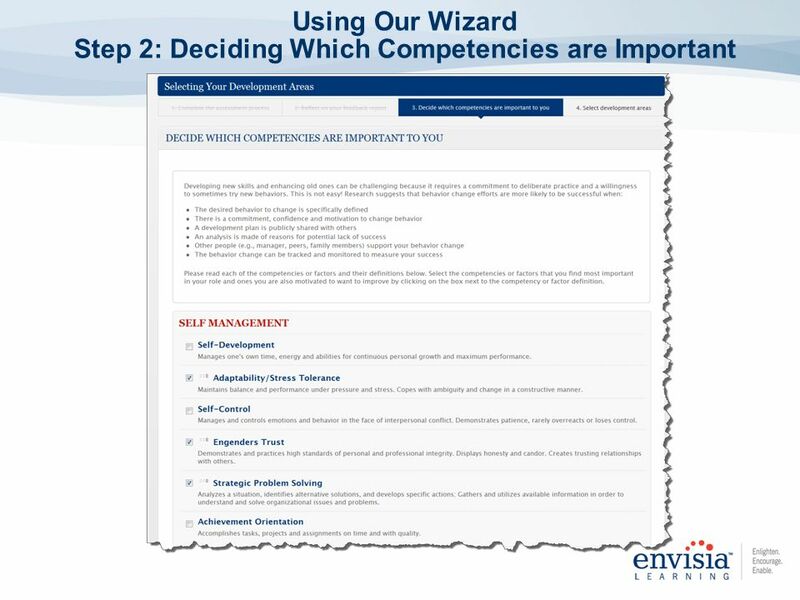 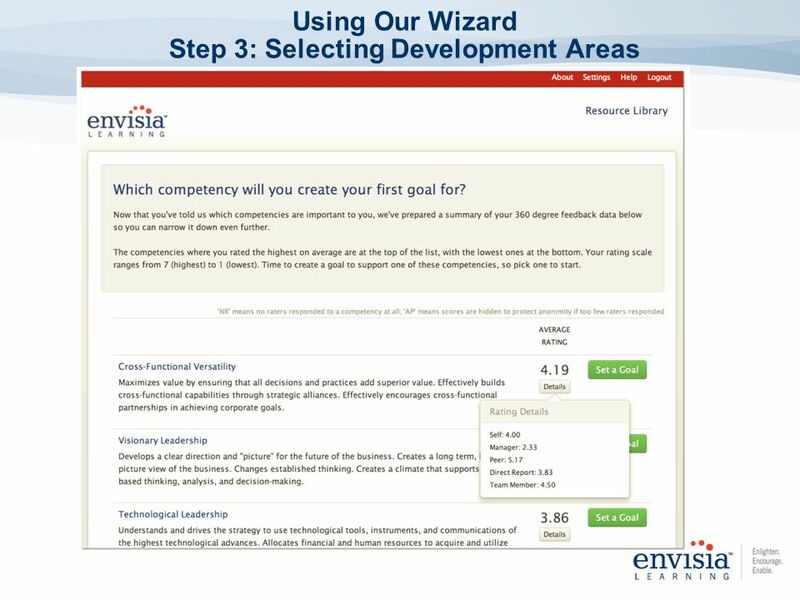 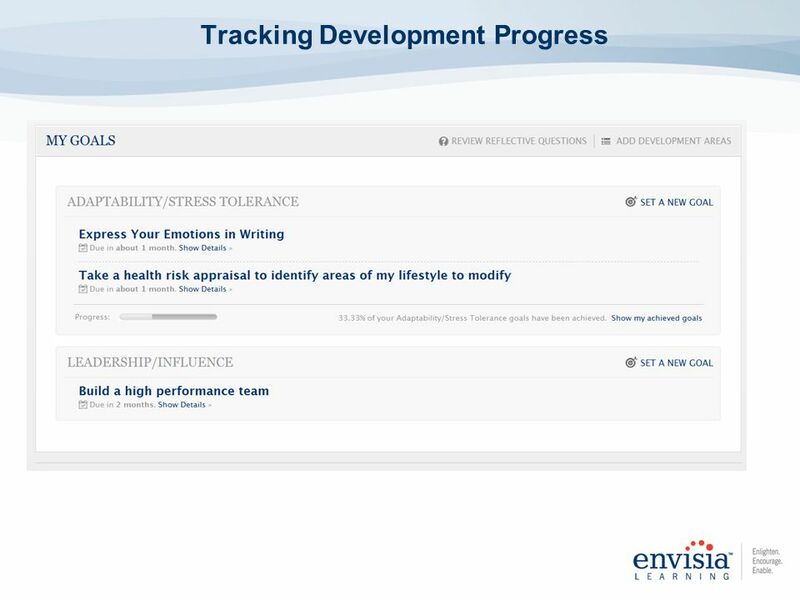 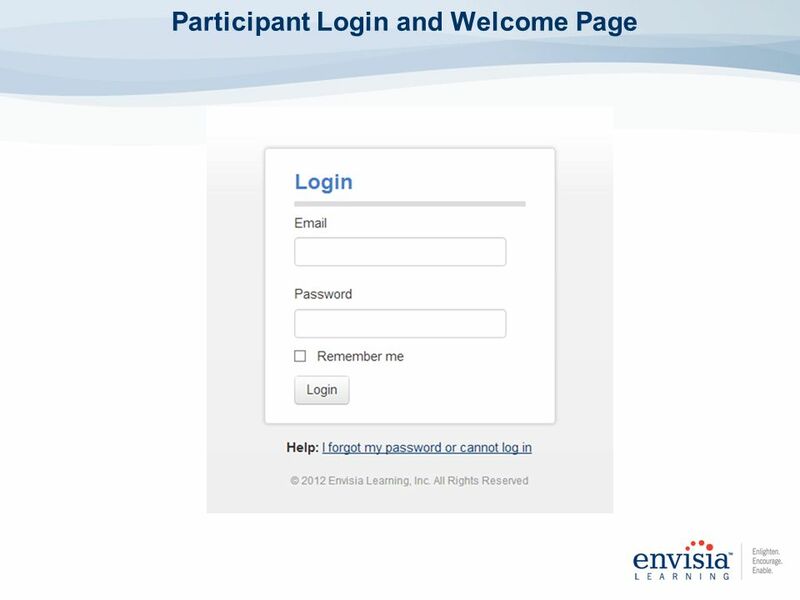 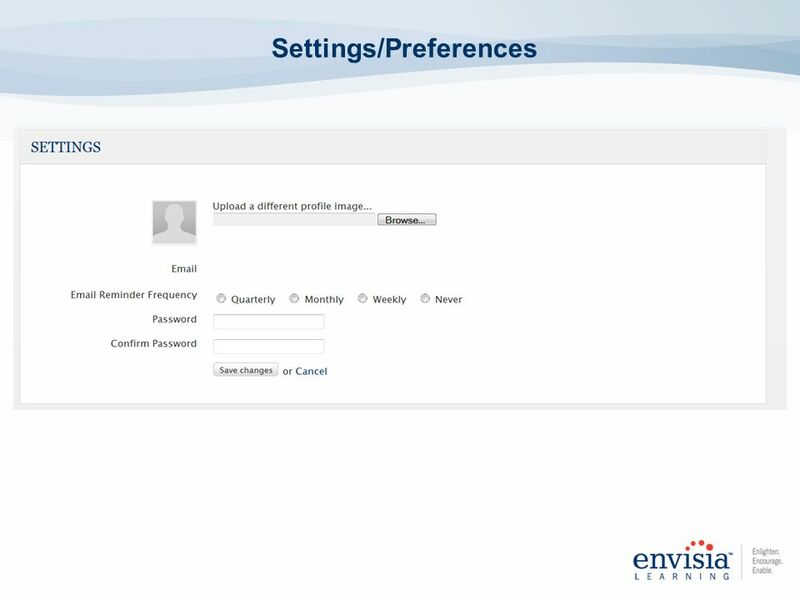 Development Planning “Wizard”: Walks you through your assessment and provide a structured way to select developmental competencies Automated Reminders: Select how often you want the system to send you reminders about due dates on your development plan (Preference Tab). 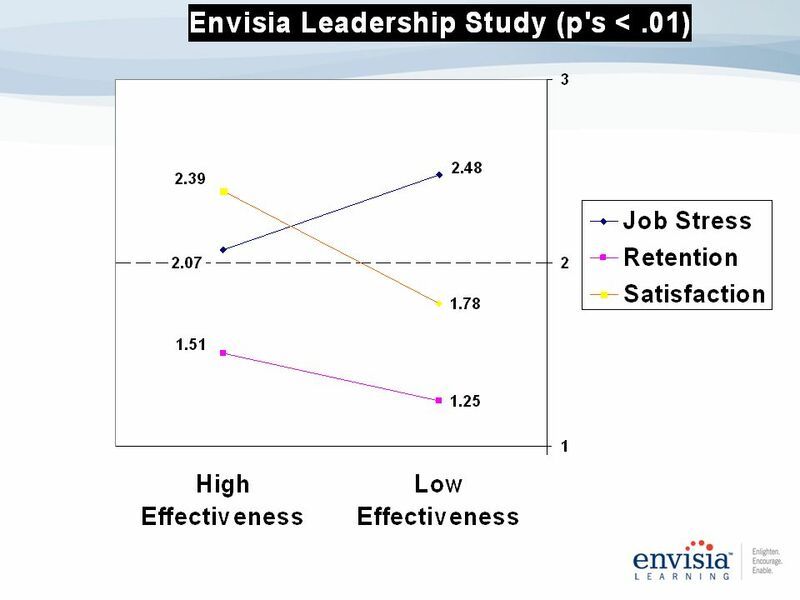 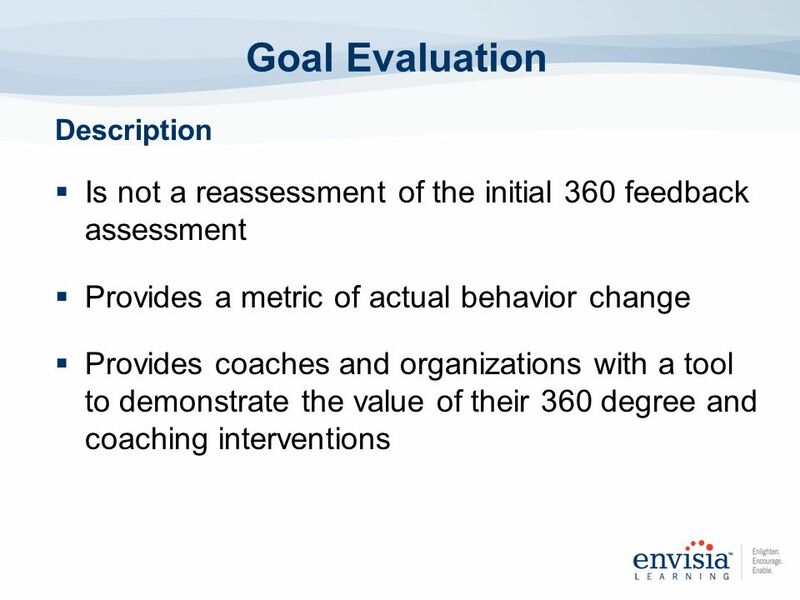 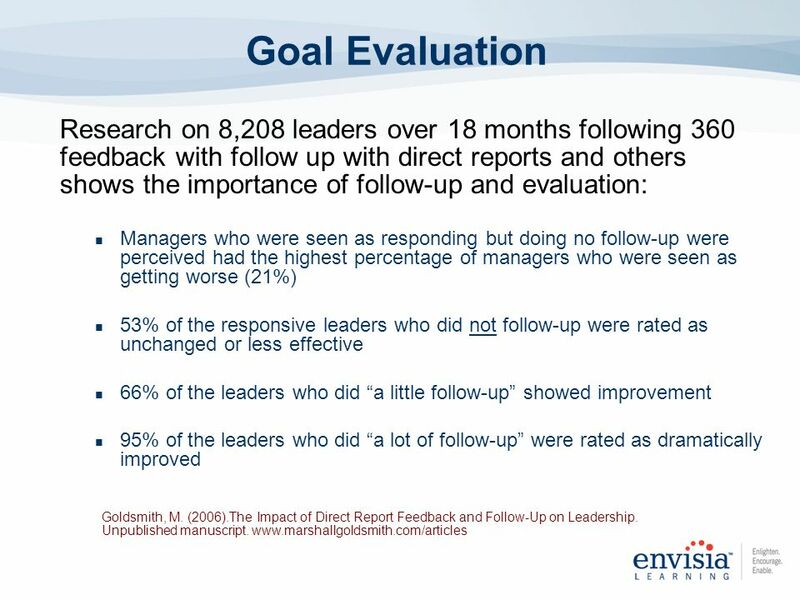 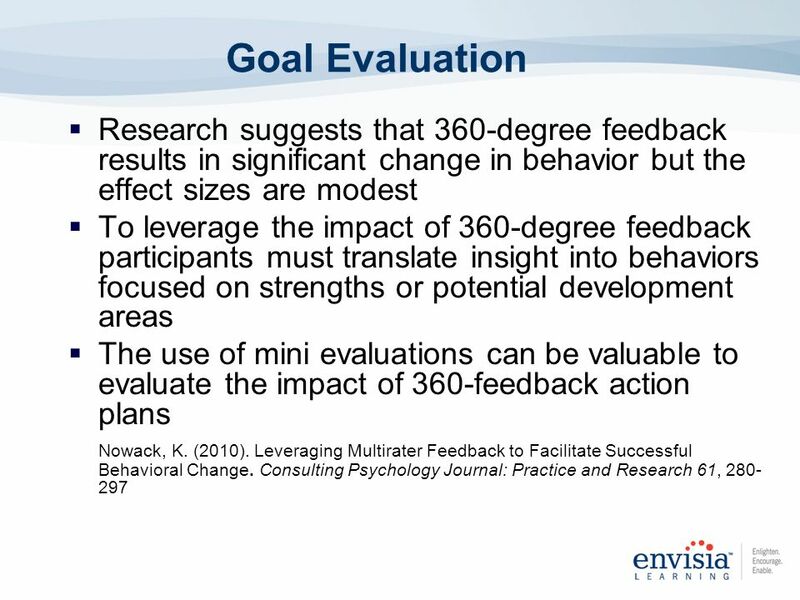 67 Goal Evaluation Research on 8,208 leaders over 18 months following 360 feedback with follow up with direct reports and others shows the importance of follow-up and evaluation: Managers who were seen as responding but doing no follow-up were perceived had the highest percentage of managers who were seen as getting worse (21%) 53% of the responsive leaders who did not follow-up were rated as unchanged or less effective 66% of the leaders who did “a little follow-up” showed improvement 95% of the leaders who did “a lot of follow-up” were rated as dramatically improved Goldsmith, M. (2006).The Impact of Direct Report Feedback and Follow-Up on Leadership. 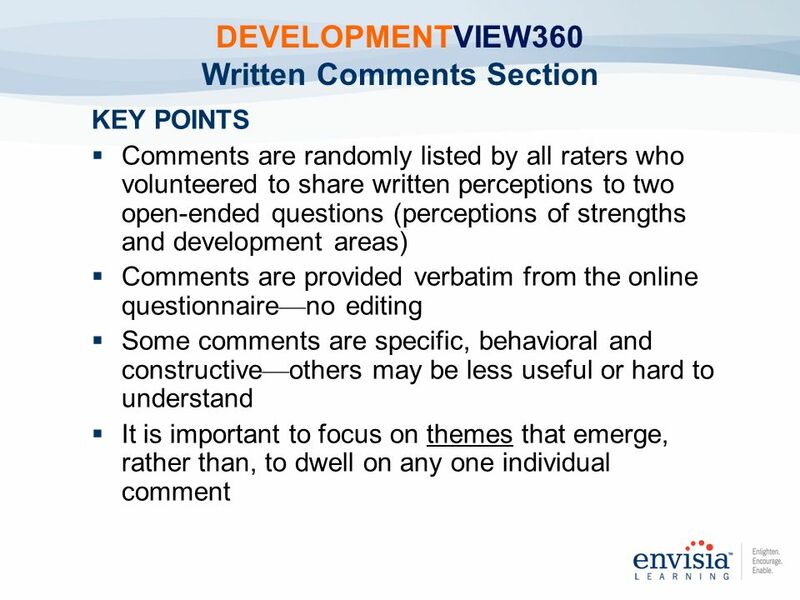 Unpublished manuscript. 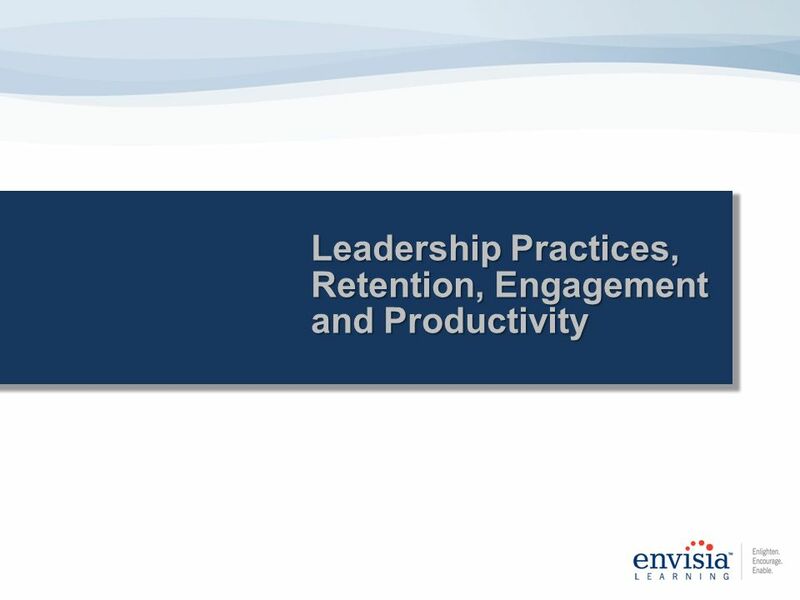 What key learnings did I get from today’s presentation? 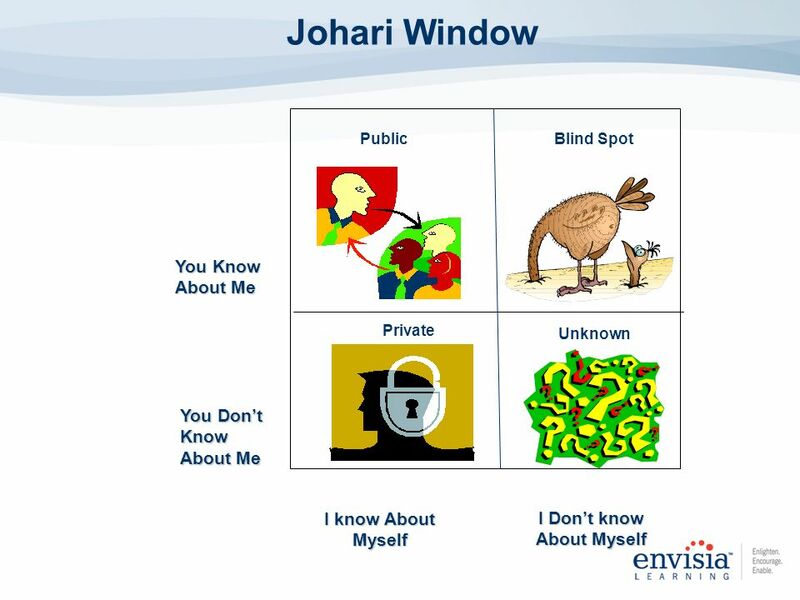 (What have I heard? 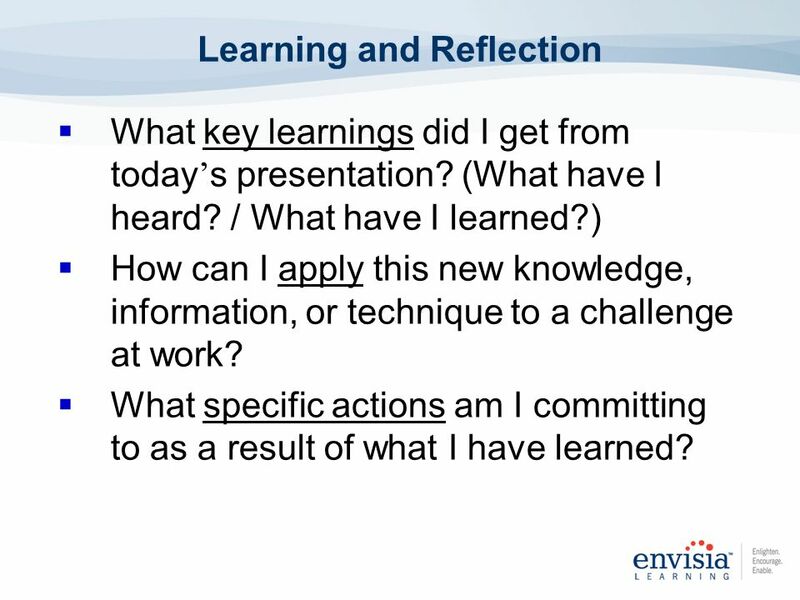 / What have I learned?) 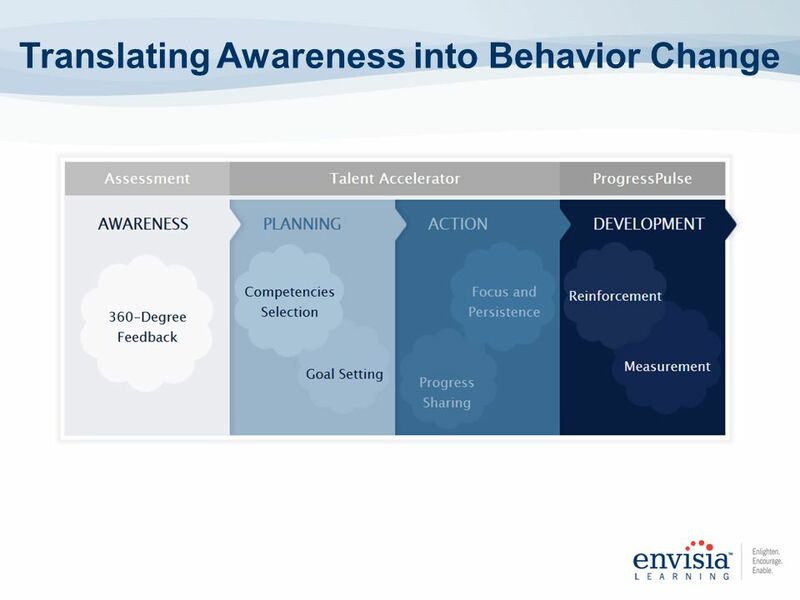 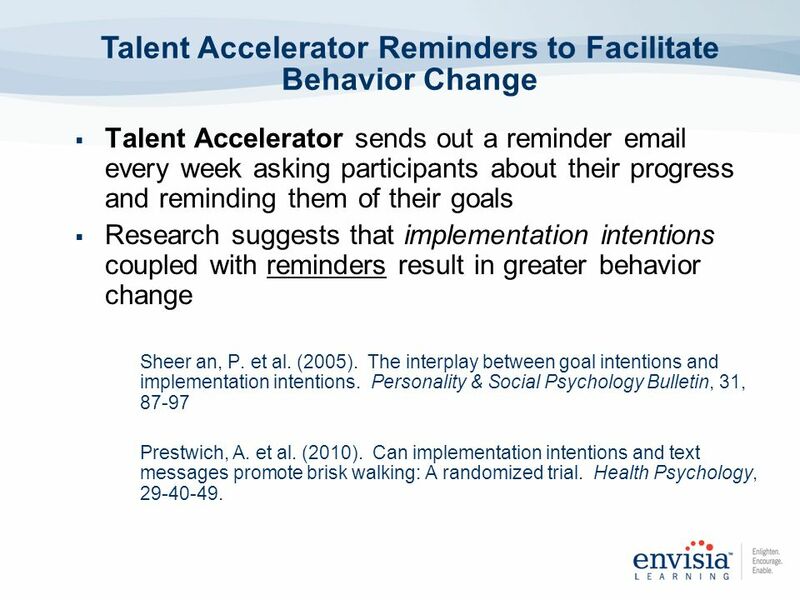 How can I apply this new knowledge, information, or technique to a challenge at work? 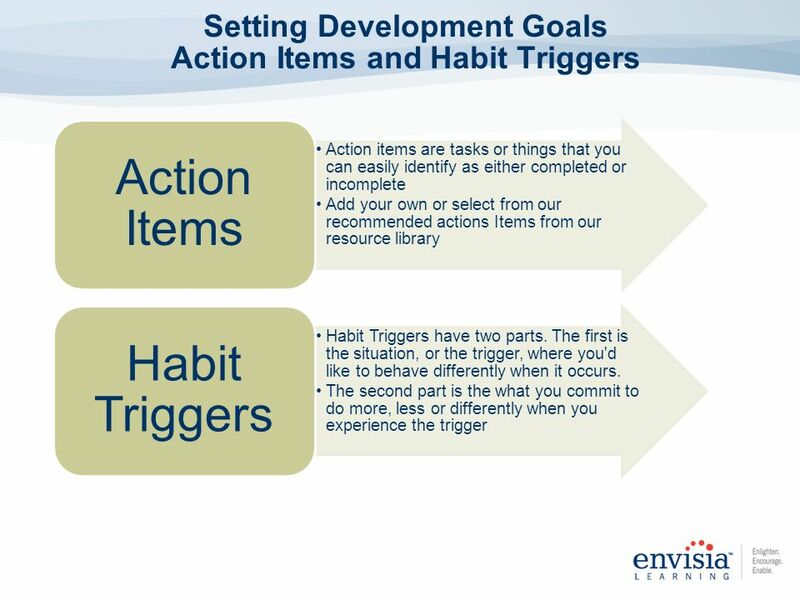 What specific actions am I committing to as a result of what I have learned? 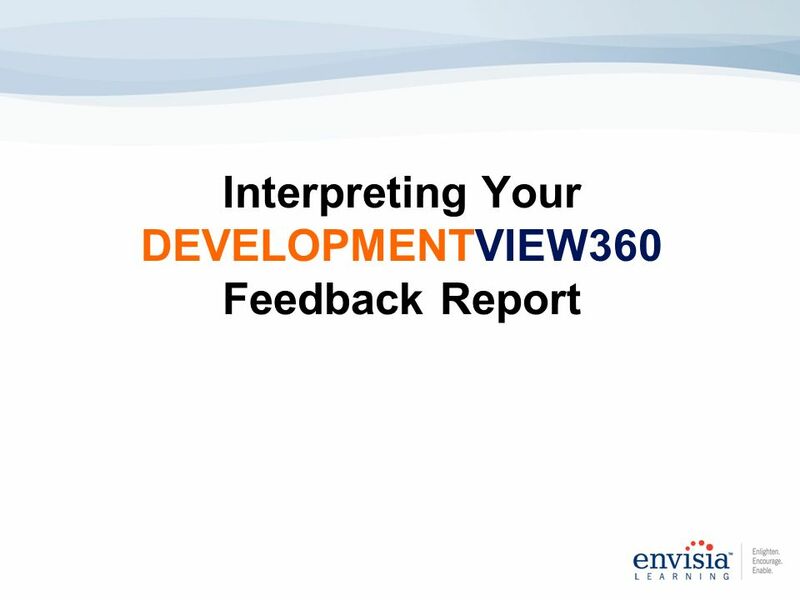 Download ppt "Understanding and Using Your DEVELOPMENTVIEW360 Report"
Plan My Care Training Care Management Working in partnership with Improvement and Efficiency South East. 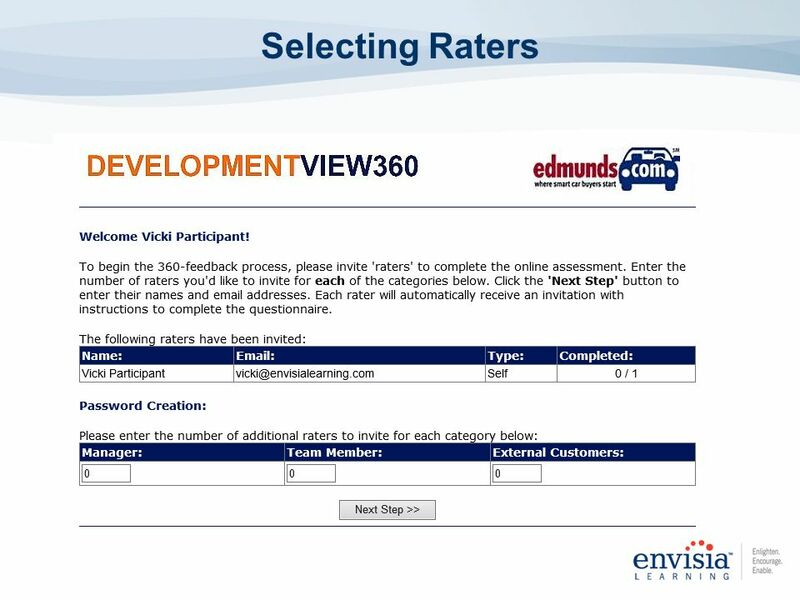 ARGOS ® Assessments v3.5 Participant Users Guide To begin, click here here © Copyright ARGOS Assessment Company 2004. 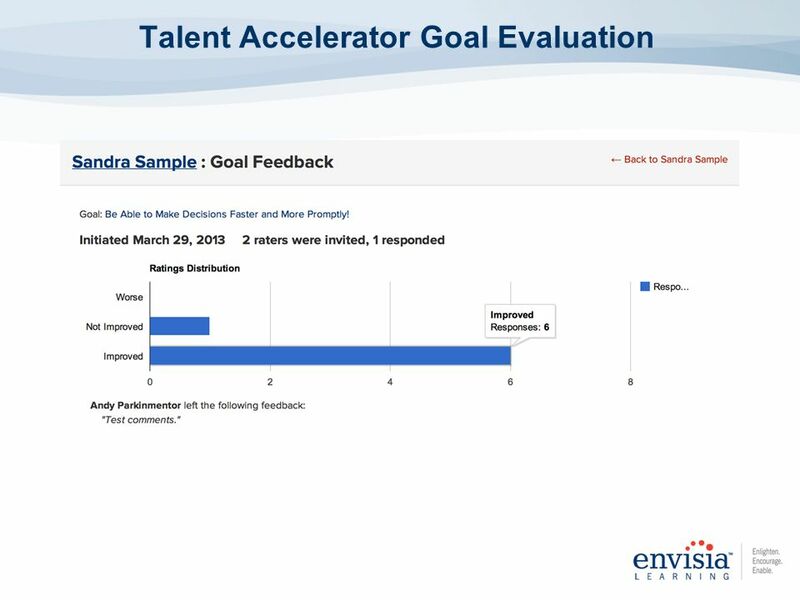 What is Pay & Performance? 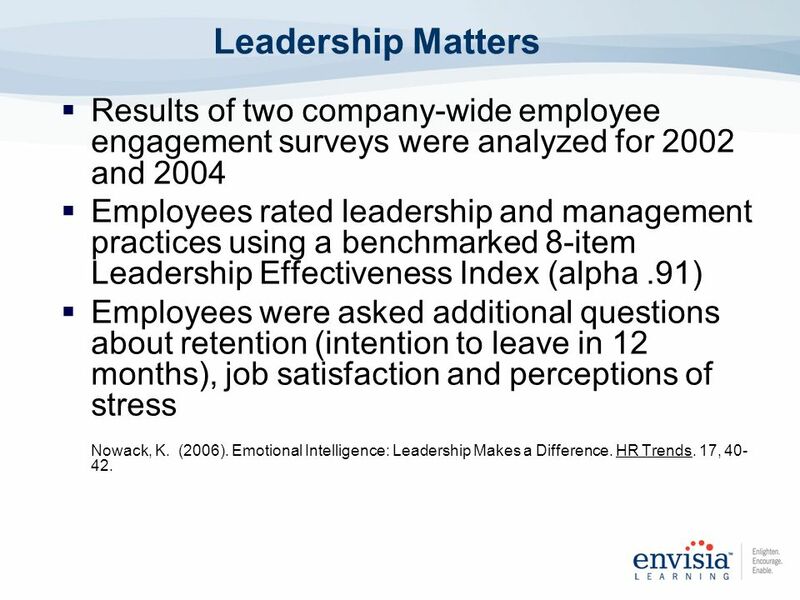 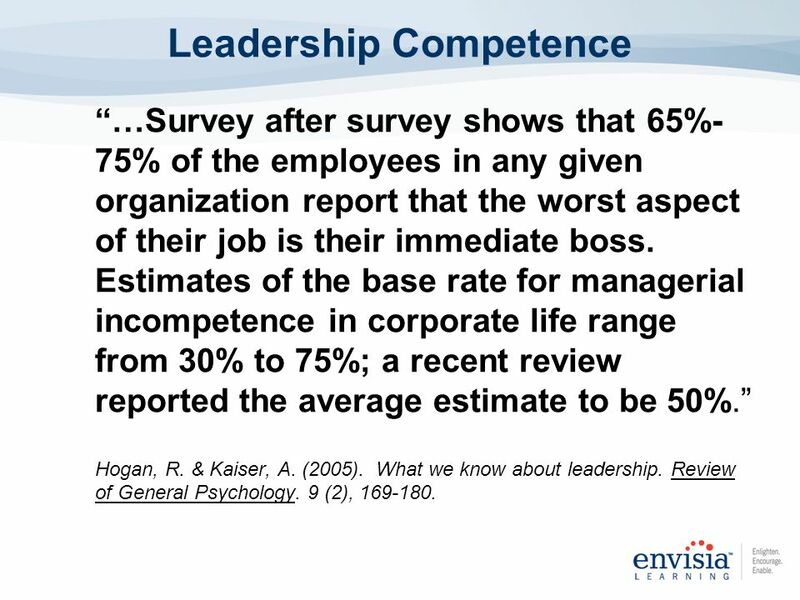 Appraising and Managing Performance (c) 2007 by Prentice Hall7-1 Chapter 7. 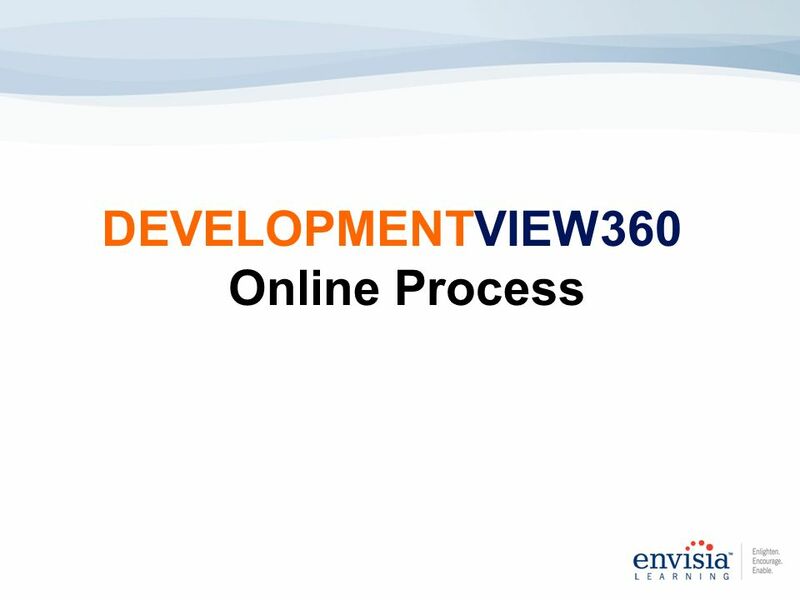 GEtServices Services Training For Suppliers Requests/Proposals.